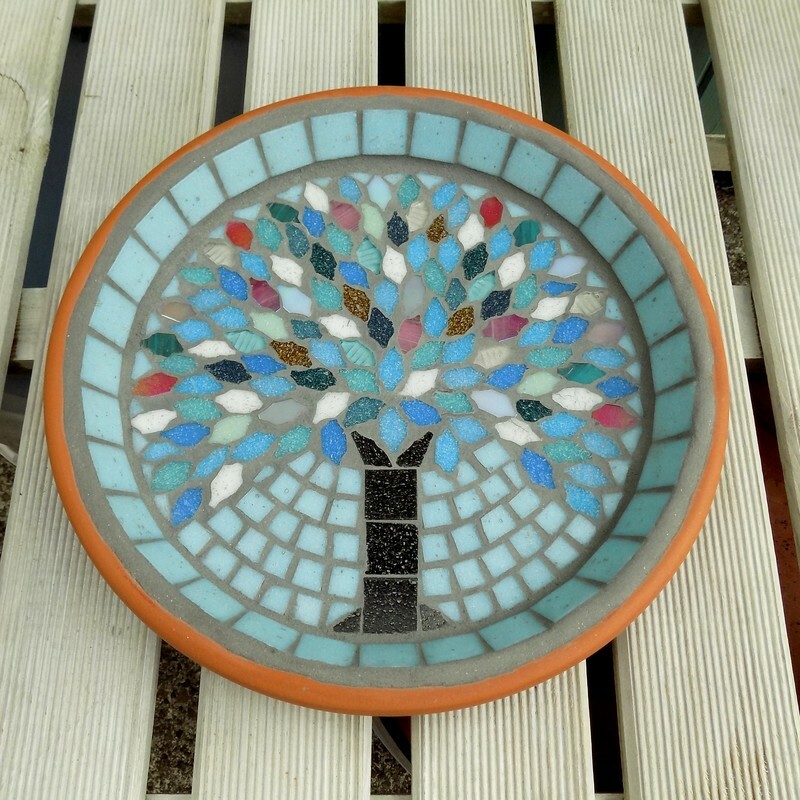 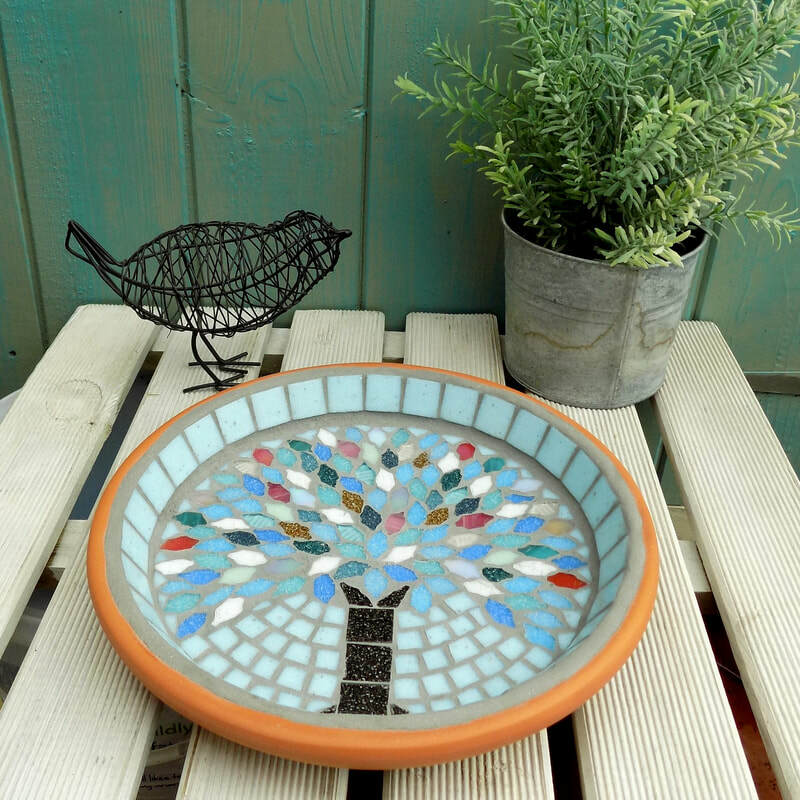 Add colour for you to enjoy and attract wild birds and other wildlife to your garden too, with a unique design, handmade mosaic bird bath. 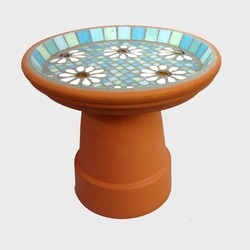 There are designs that will suit any style of garden from modern contemporary to traditional cottage, and these bird baths will fit into any size garden, large or small. You can place them in a garden border, or on a patio or deck, or you could even have one on a balcony. ​They are ideal for attracting wild birds and are great for other wildlife, including hedgehogs, to drink from too, so will help to bring natural pest controllers to your garden. A bird bath would also make a lovely, special gift for a garden lover, or a wildlife and nature lover and would be an ideal new home gift too. All patterns are designed and created by JoSara. 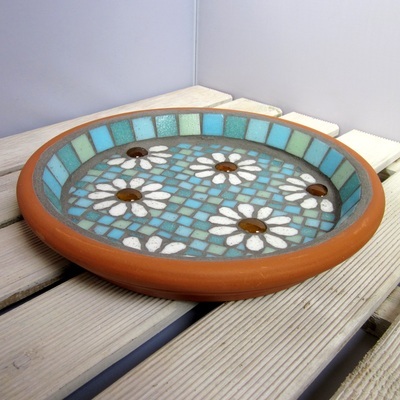 MADE TO ORDER bird bath designs. 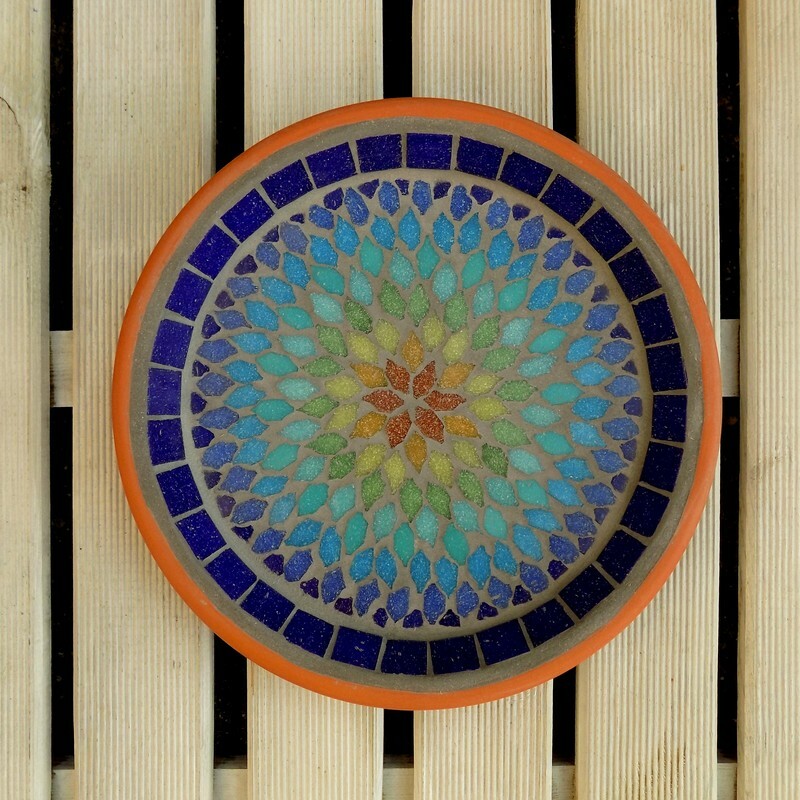 Scroll down the page to find full details on each design. 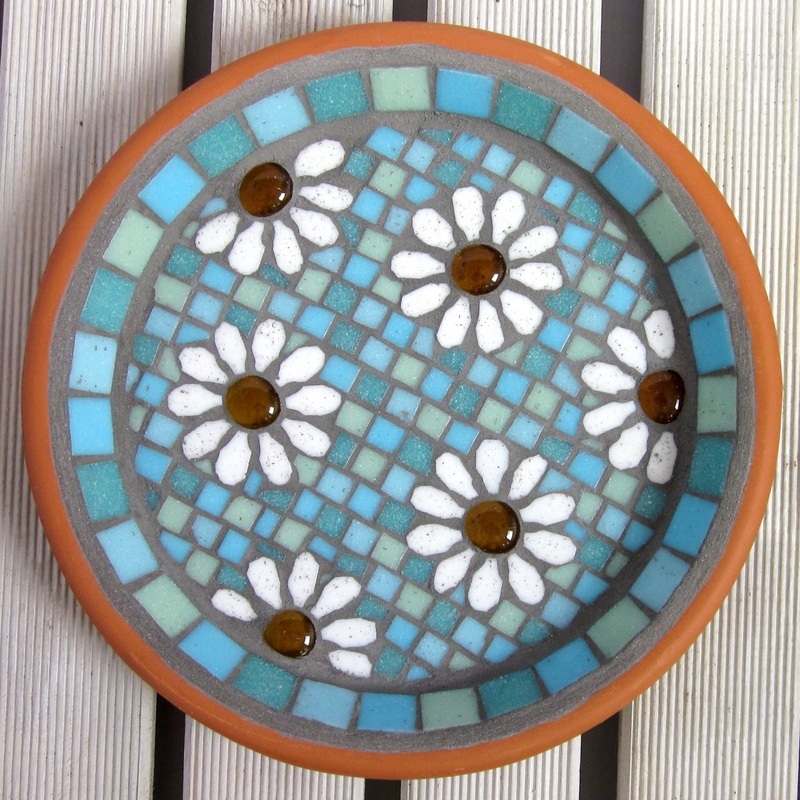 Made to Order All designs will be made on receipt of an order, you can check at the top of the page roughly how long it will be before posting if ordering today. If you need to know a definite shipping time before ordering just contact me and i'll let you know. You will receive an email within 24 hours of your order to let you know the estimated shipping date. 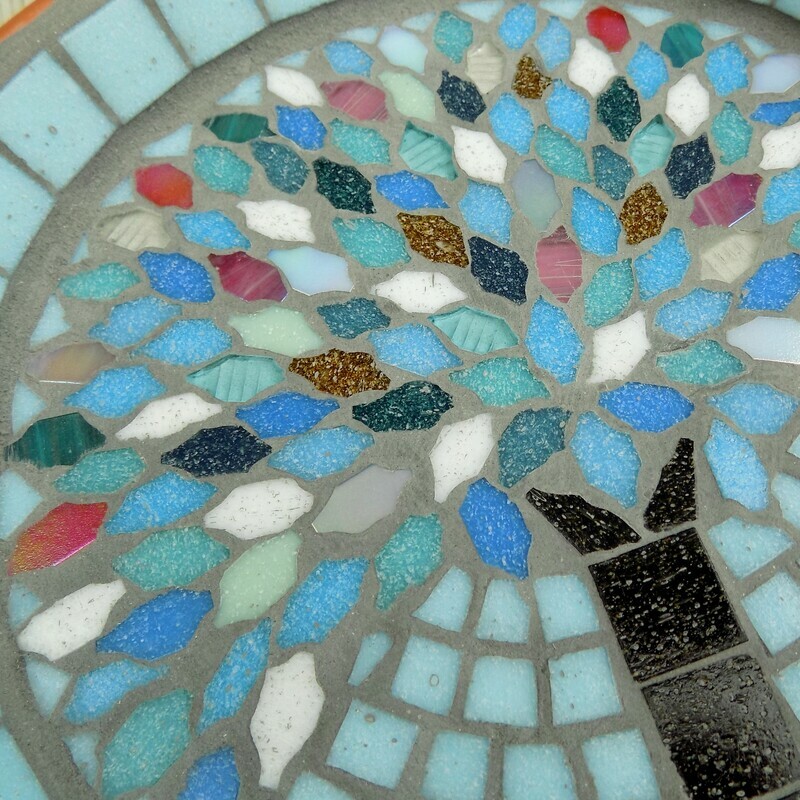 If stones are used in the design they may be different to the ones pictured, but will still be in keeping with the design. Designs may vary very slightly due to the tiles being handcut, and different tile batches possibly having a small colour shade differences. 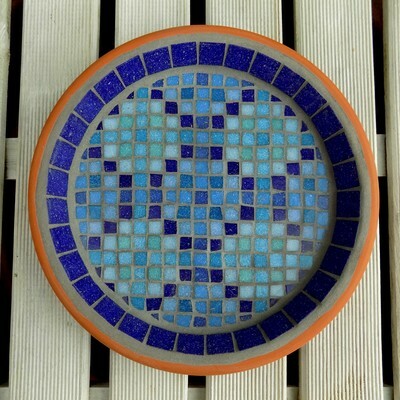 ​Postage Combined postage is available on most UK orders. 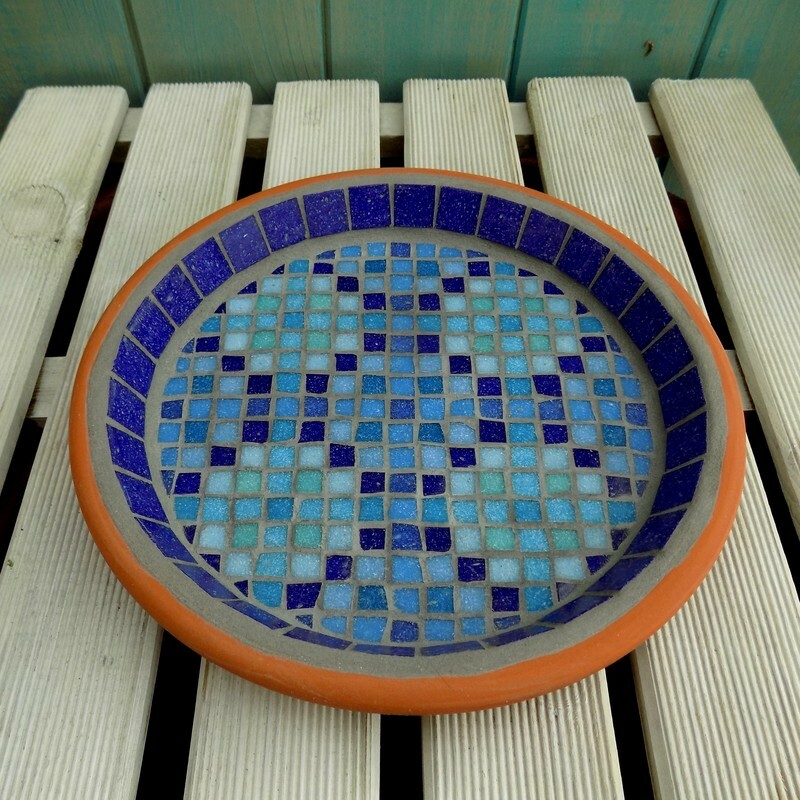 The bird baths and large plaques will have £3 UK postage each on the first two ordered within the same order (any items ordered under the same uk address before the first item is posted), then free postage on any items after that,so capped at £6 for the order. 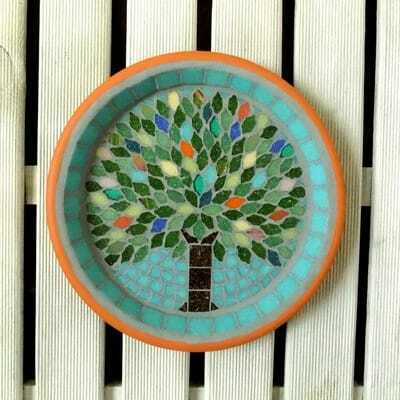 All large items will be sent in separate parcels. 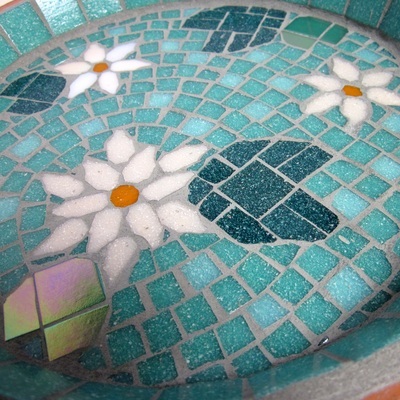 All postage savings will be refunded to the method of payment as soon as I pick up the order emails. 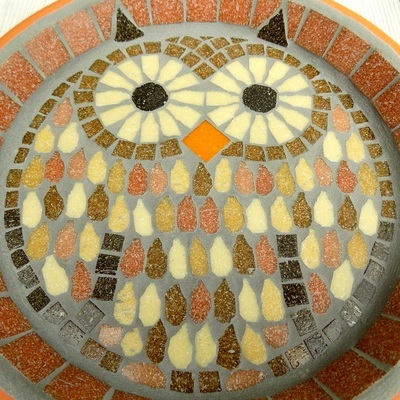 Typical shipping times for U.K. will be 3 working days with Royal Mail. Full postage details can be found in the Terms and Conditions. International Buyers If you are outside of the U.K. you can purchase most items in your own currency and with the correct postage for your country from my Etsy shop, JoSaraUK, click here to be redirected. 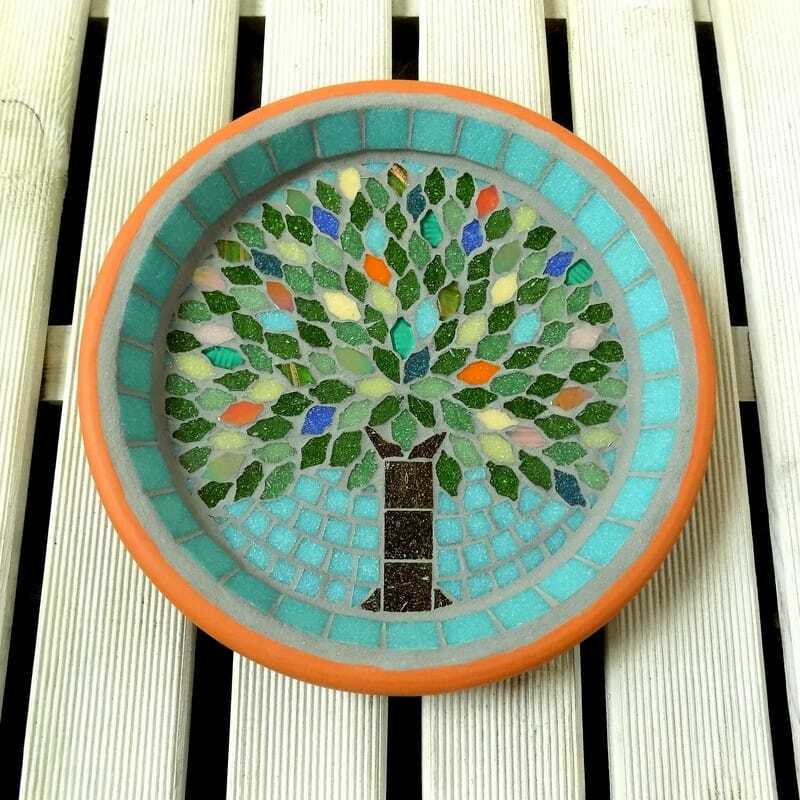 If the item you want isn't available there please contact me and I will list it on the site for you, or I can invoice you directly using Paypal if you prefer. 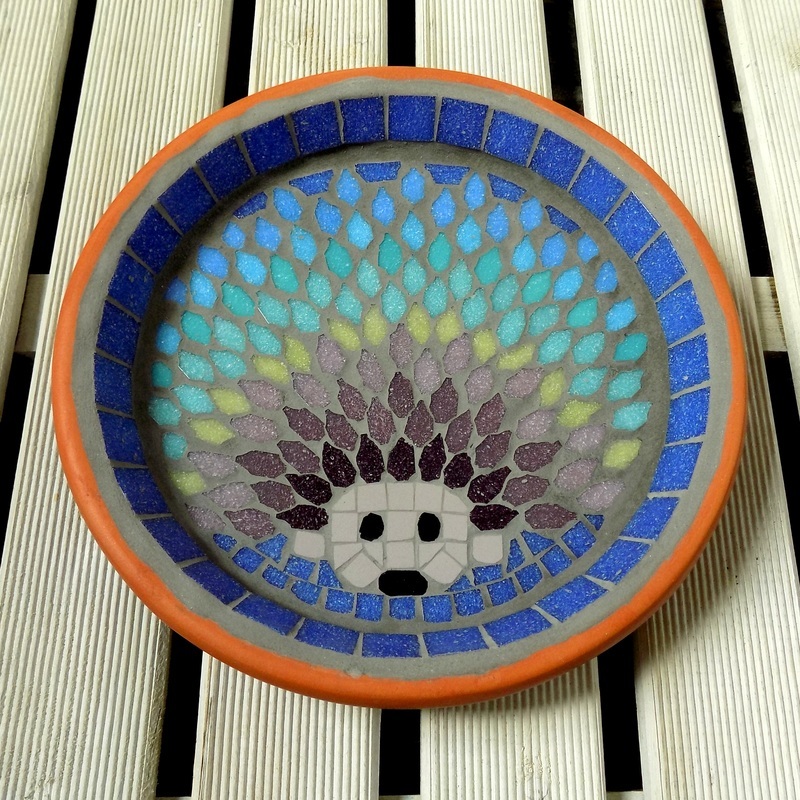 All shipping details can be found in the listings on Etsy. 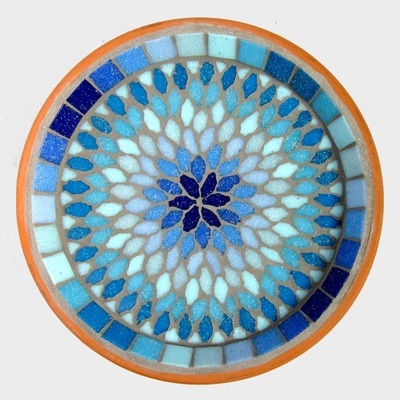 How to Order Just click on the Buy It Now button to order an item. 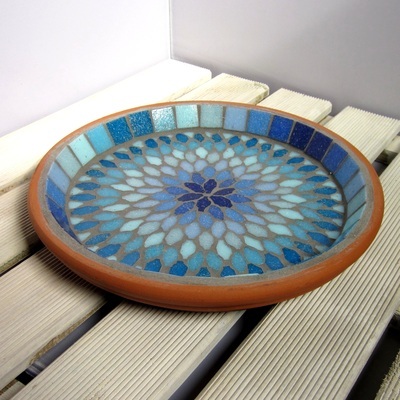 Each item has to go through as a separate transaction so you have to return to JoSara.co.uk after Paypal checkout to order the next item you want, but combined postage is available (see above). 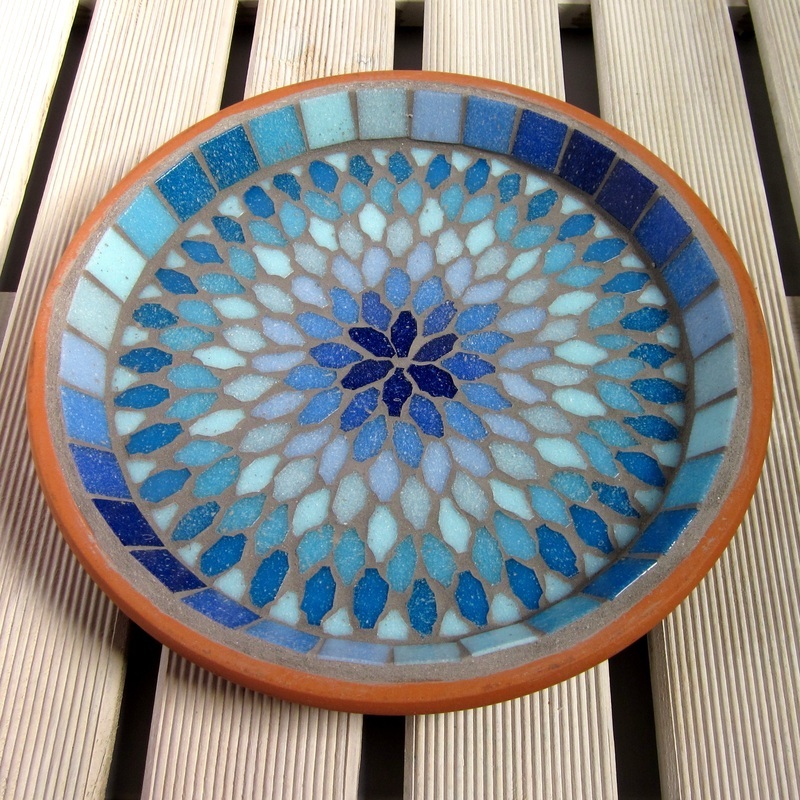 All payments are made through Paypal. but you can still pay with a Debit or Credit card through Paypal without setting up an account, just look for the 'pay with a card' link in the Paypal checkout screen. 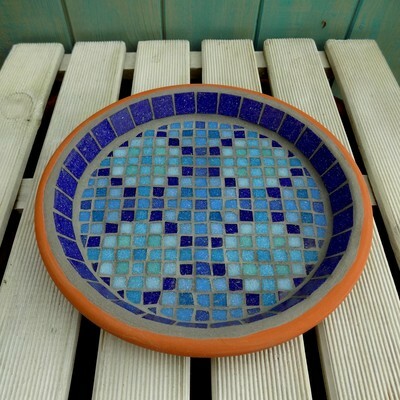 If your bird bath order is a gift being sent direct to the recipient's address, with or without a gift box, just put a quick note to say that in the Paypal checkout, or send me a quick message on jo@josara.co.uk, and I can leave all the paperwork out of the box, and add a gift message if wanted (just let me know what your message is at the same time you're sending me the note that it's a gift). 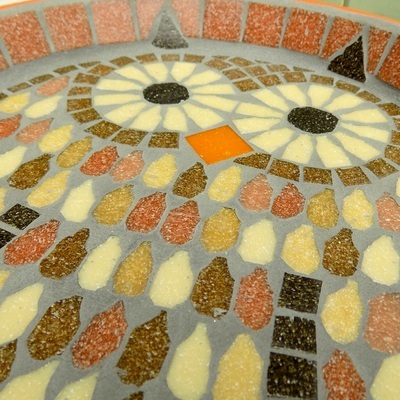 I'll secure the box and add some twine finished in a bow to the parcel. 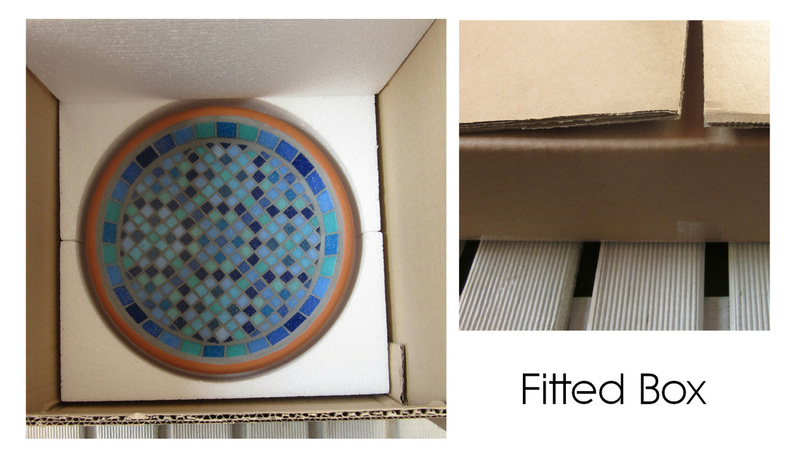 The bird baths are sent in very secure packaging, but if the bird bath is a gift and you'd like something to make wrapping simple, or if you are sending the bird bath as a gift direct to the recipient, this box has a full polystyrene lining that the bird bath sits inside of, in it's own custom fit cardboard box which is perfect for secure transporting, as well as being a nice way to present the bird bath. 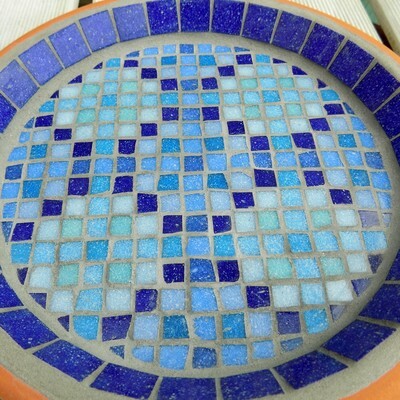 To purchase a box, just order the bird bath, then pop back here and order the gift box as a second transaction. (PLEASE NOTE This box isn't available on it's own, only as an add on for a 25cm bird bath, 21cm water dish or a 25cm garden plaque order. 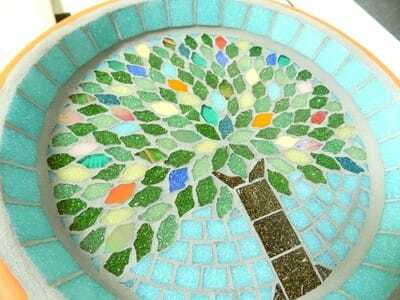 This mosaic jewel tree Spring design has random, translucent, metallic streaked, and iridescent tiles to add sparkle and shine between the greens, with pastels for blossom, aqua skies, and fresh greens. The bird bath design is finished with a turquoise background and border. 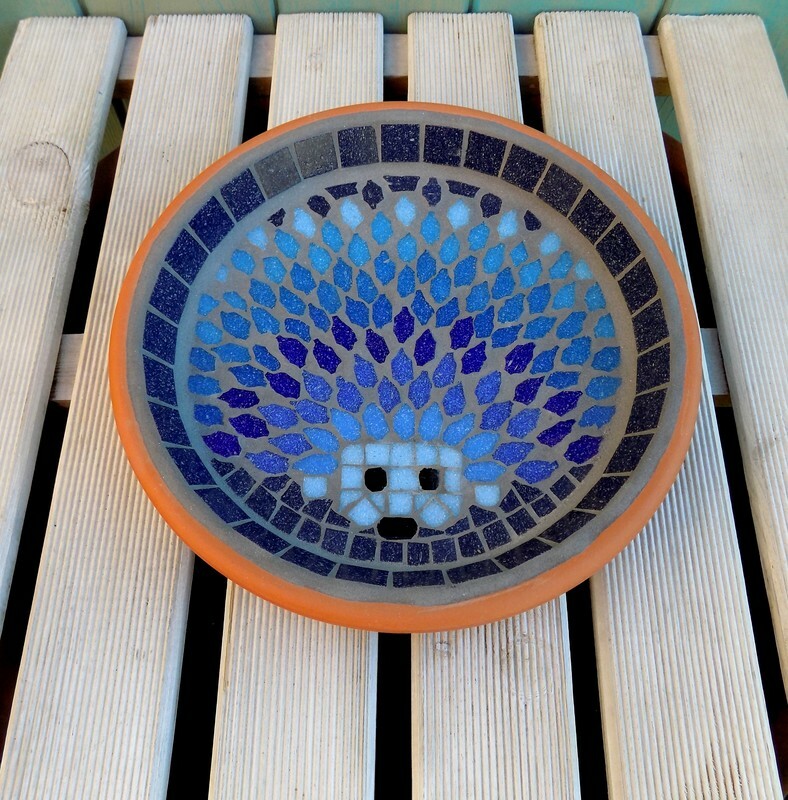 This listing is for the bird bath saucer only. The saucer can be used freestanding on the ground. 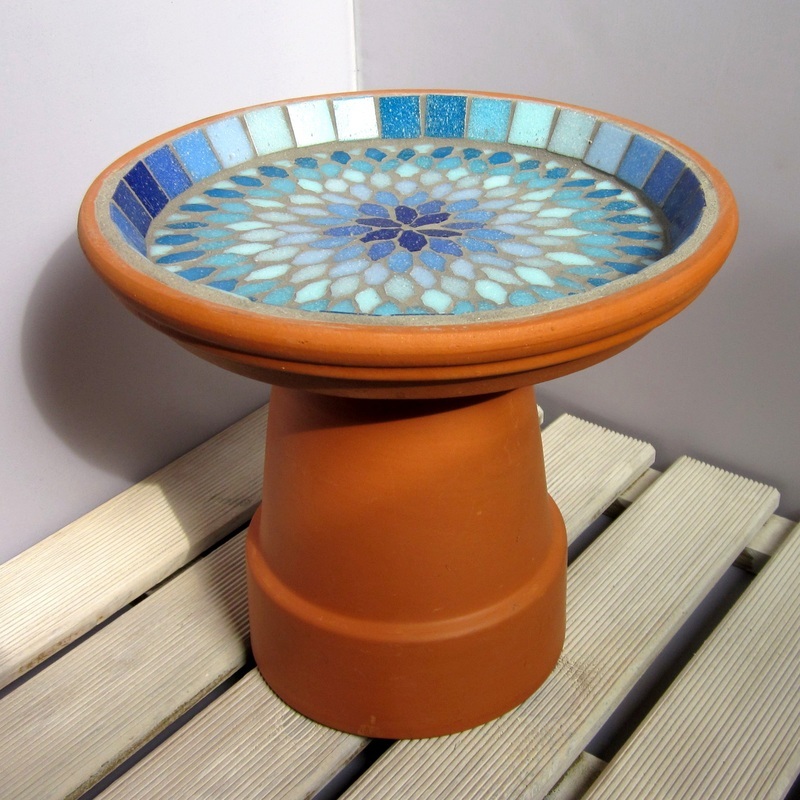 or your could raise it up on an upturned terracotta flower pot (around 13-15cm would be ideal), a plant stand, or pot feet. 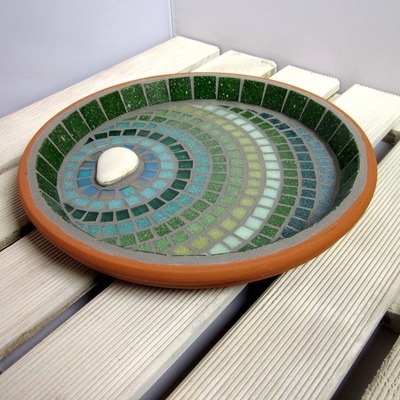 Materials - Terracotta saucer, and vitreous glass and ceramic tiles, finished in a grey grout designed to repel algae and mold. Use - Suitable for exterior use, but it should be drained to prevent the mosaic being encased in ice in very cold weather. 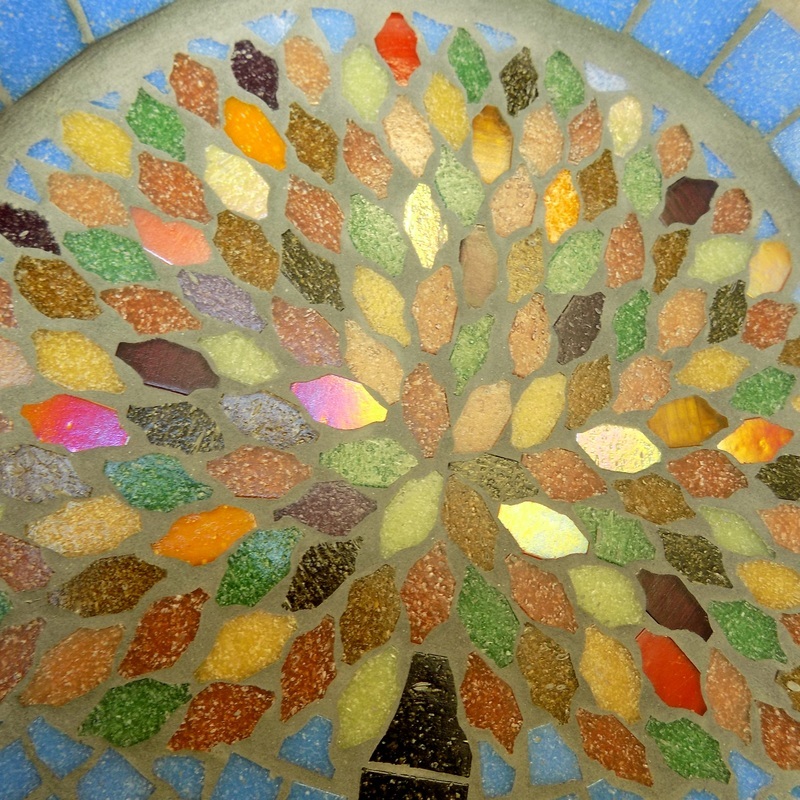 With a touch of tapestry feel to this design, this mosaic tree has random bright, translucent, metallic streaked, and iridescent tiles to add sparkle and shine between the greens, and shows the deep colours of summer. The bird bath is finished with a pastel jade green background and border. 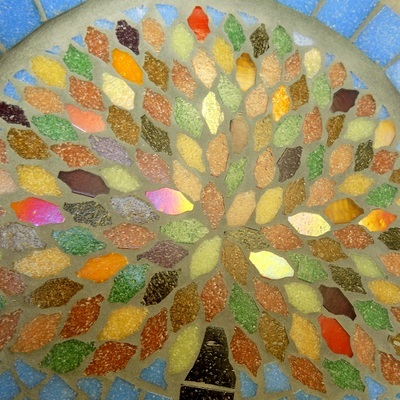 There's a tapestry feel to this design, with a mosaic tree that has random rich, translucent, metallic streaked, and iridescent tiles to add sparkle and shine between the browns and terracottas which show the rich colours of autumn. The bird bath is finished with a light sky blue background and border. 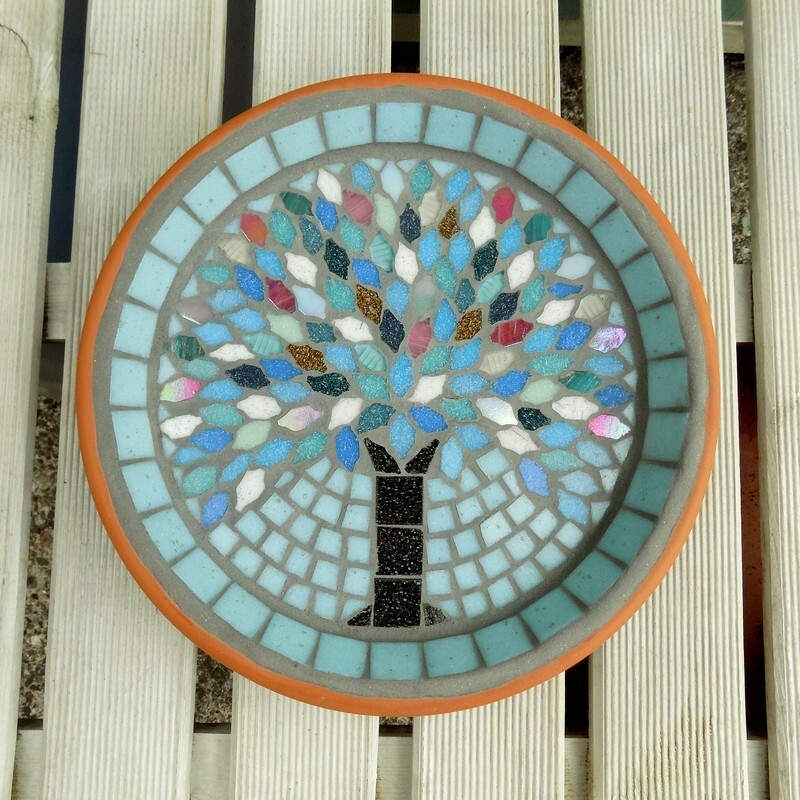 Using the colours of frosted evergreens, ice and snow, berries, bare branches and the pink and orange sunsets, with the pale blue winter sky as the background and border, this winter tree also has iridescent and translucent tiles to add extra interest to the design too. 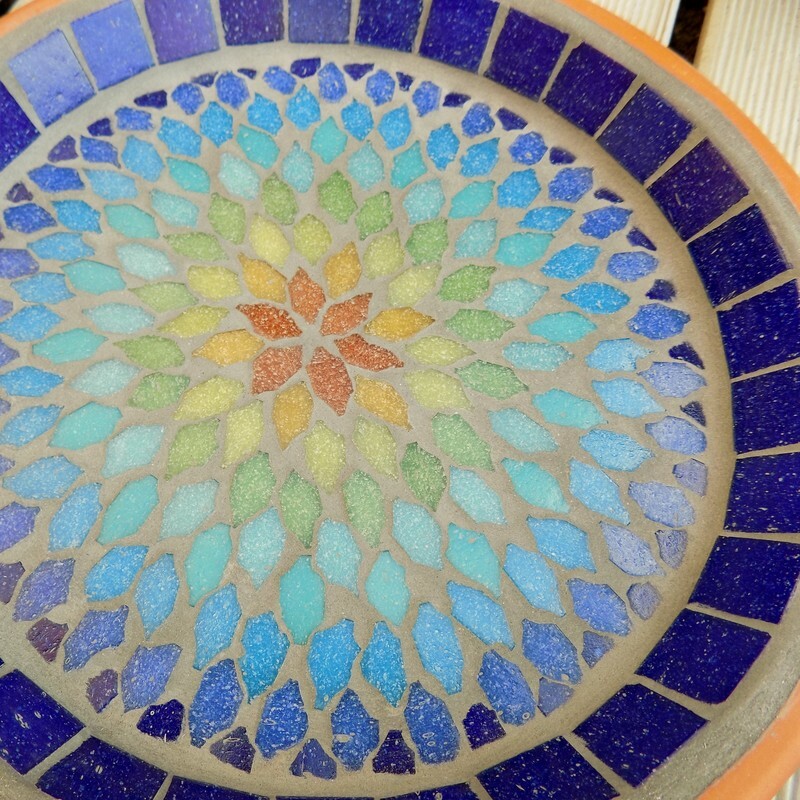 Using a mandala style pattern this rainbow of colour mosaic bird bath has a lovely, soft bohemian feel to it. 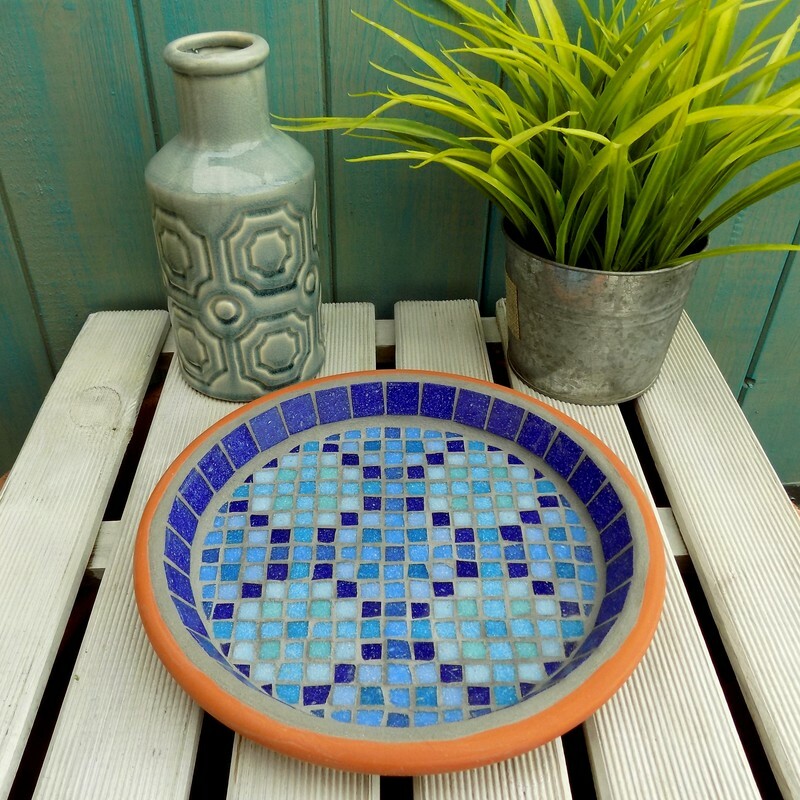 Great for adding a splash of colour to the garden. A perfect gift for anyone who loves their garden, and their garden wildlife as this bird bath makes a great water dish for hedgehogs and other animals too. 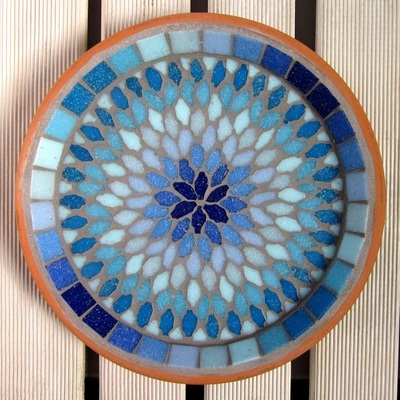 This listing is for the bird bath saucer only. The saucer can be used freestanding on the ground. 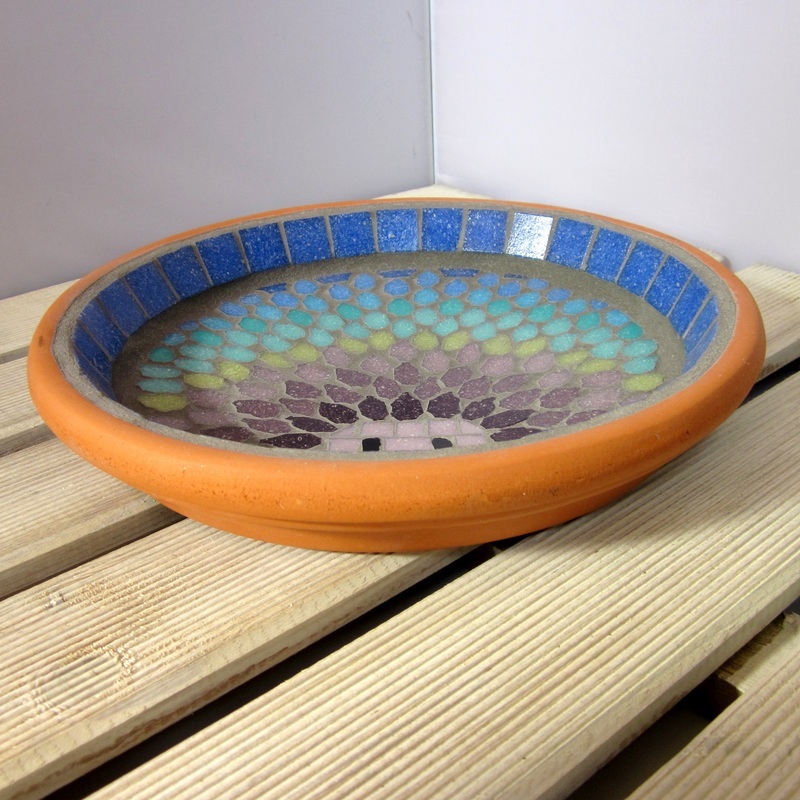 Or, if you would like to raise it up, you could use an upturned terracotta flower pot (around 13-15cm would be ideal), a plant stand, or pot feet. Materials - Terracotta saucer, and vitreous glass tiles, finished in a grey grout designed to repel algae and mold. 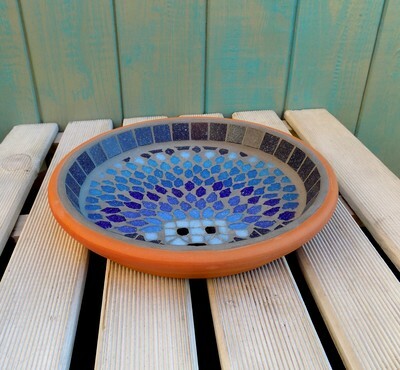 A mini Moroccan style pool to cool your garden birds and give a splash of blue in your garden. 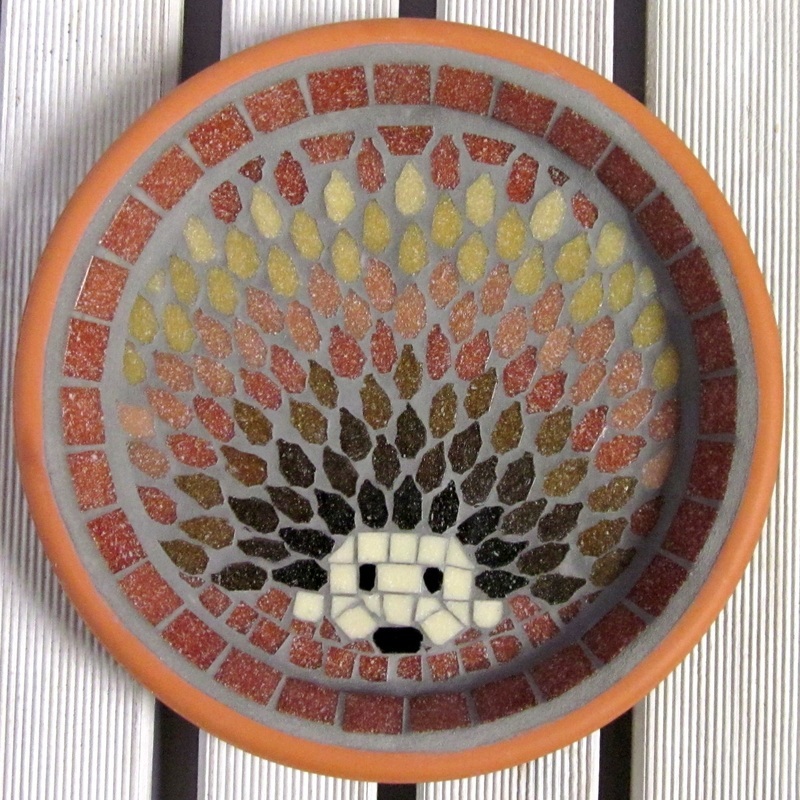 This saucer is ideal for birds to bathe in and other wildlife to drink from, and it makes a great hedgehog water dish. 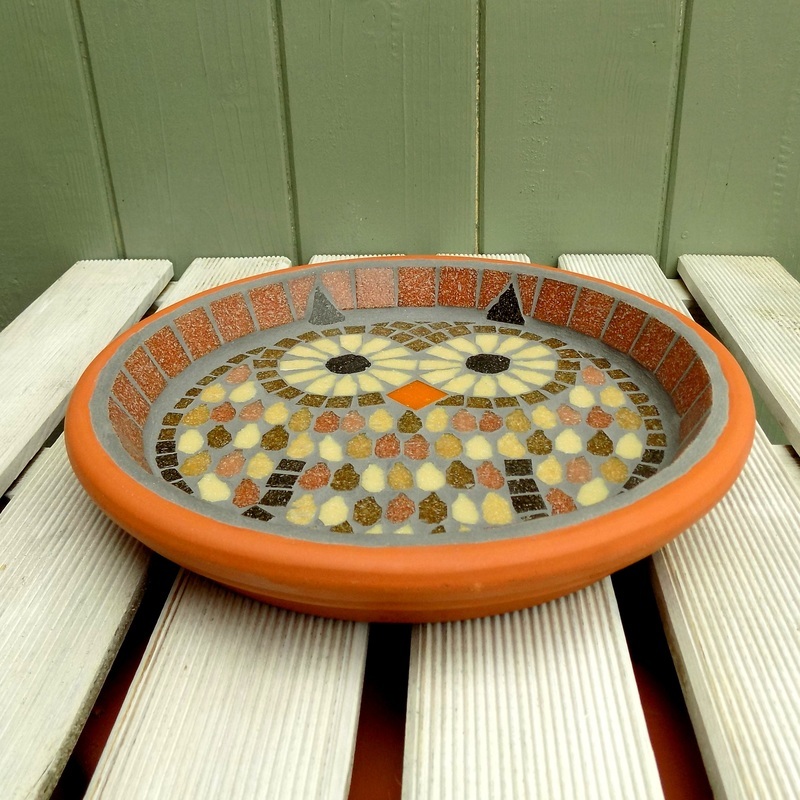 It's also a perfect gift for anyone who likes gardening and wildlife. 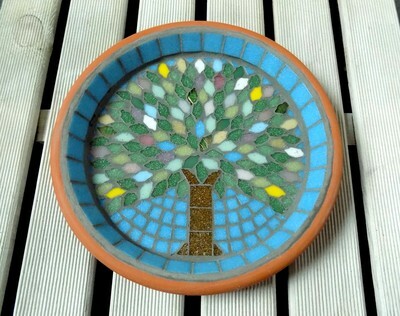 Or you could use this saucer with floating candles to create a magical atmosphere in the evening in the garden. 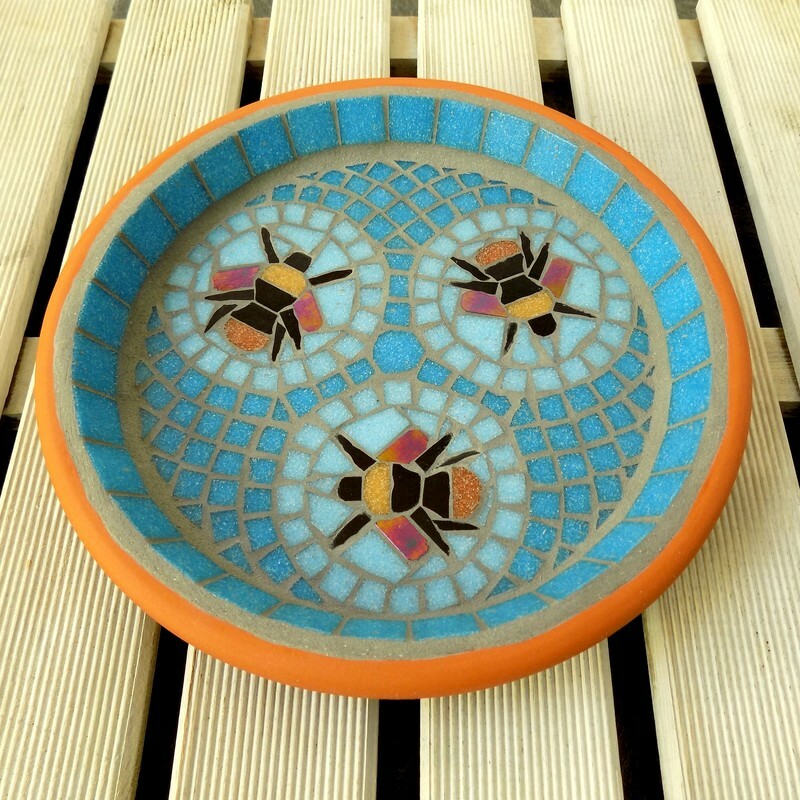 This listing is for the bird bath saucer only. The saucer can be used freestanding on the ground. 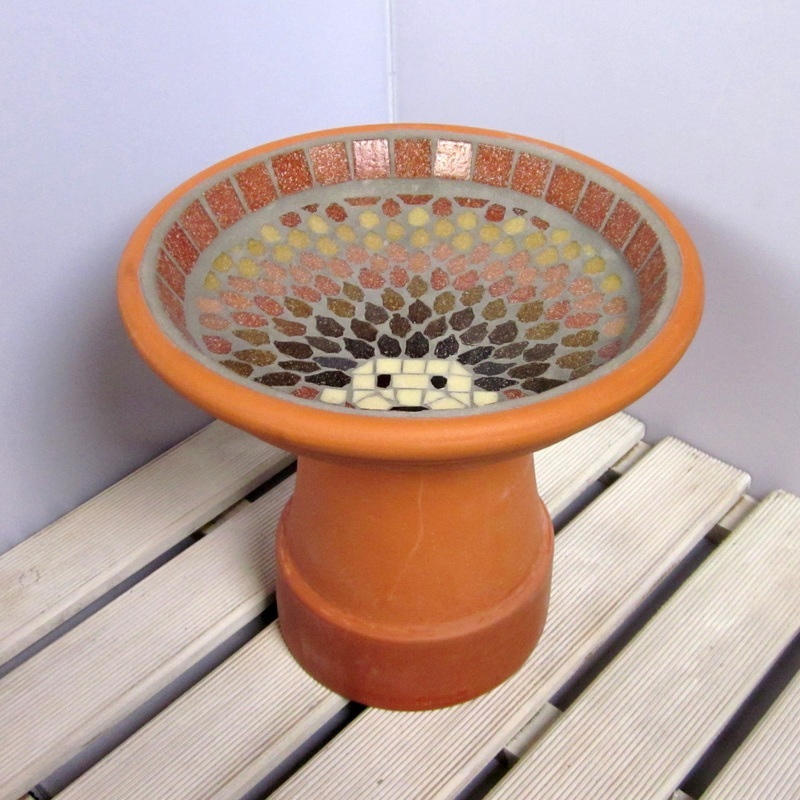 Or you could raise it up on an upturned terracotta flower pot (around 13-15cm would be ideal). 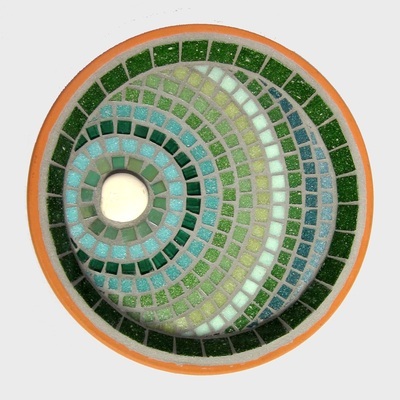 ​​Materials - Terracotta saucer, and vitreous glass and ceramic tiles, finished in a grey grout designed to repel algae and mold. 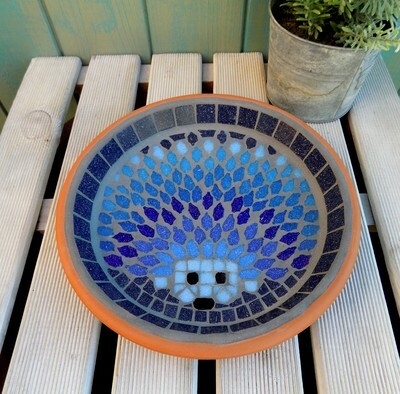 The hedgehog in this garden bird bath has a rainbow of colours in it's spines with plums to lavender purples, apples and jade greens, and aqua and sky blues. 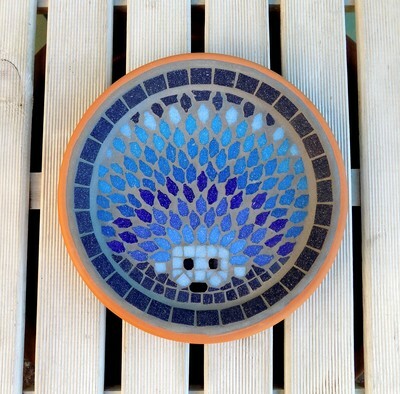 The background and border is a deep sky blue. 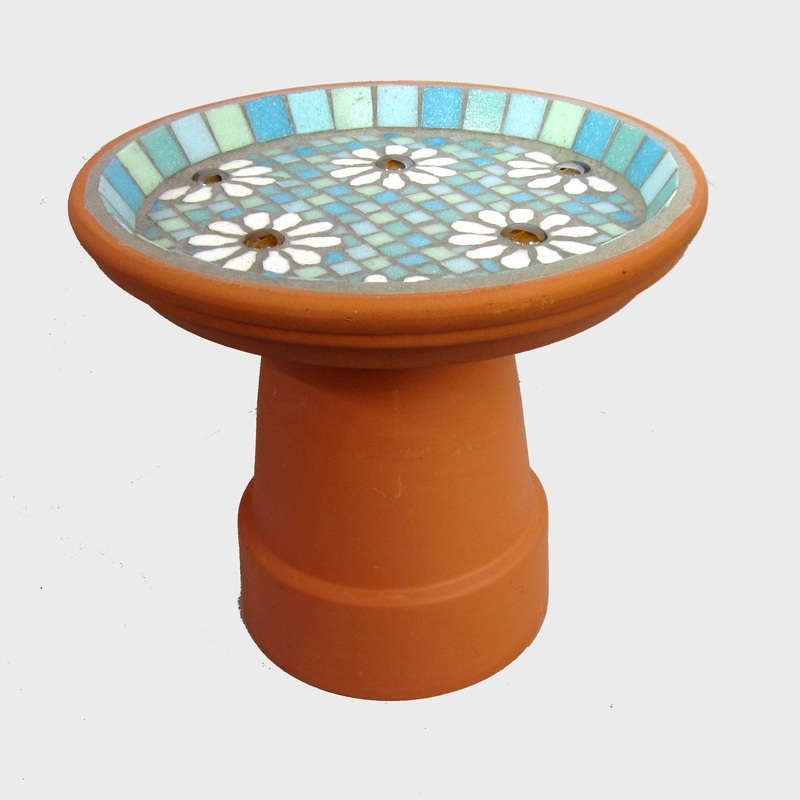 The saucer can be used as a bird bath for large and small garden birds. And it can also be used as a water dish for your garden wildlife, including hedgehogs too. 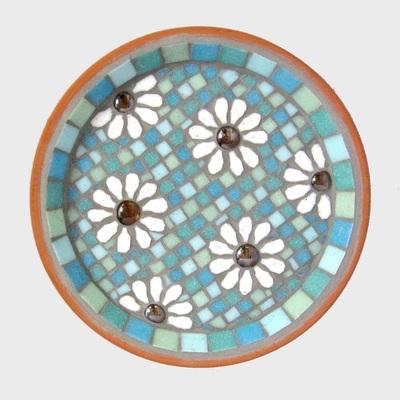 This listing is for the bird bath saucer only. 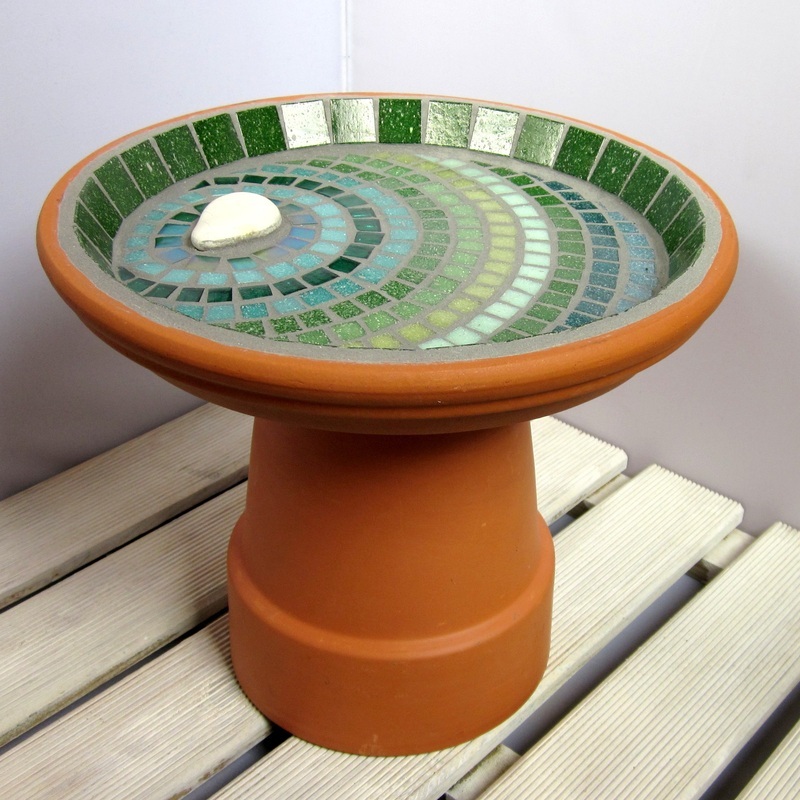 The saucer can be used freestanding on the ground. 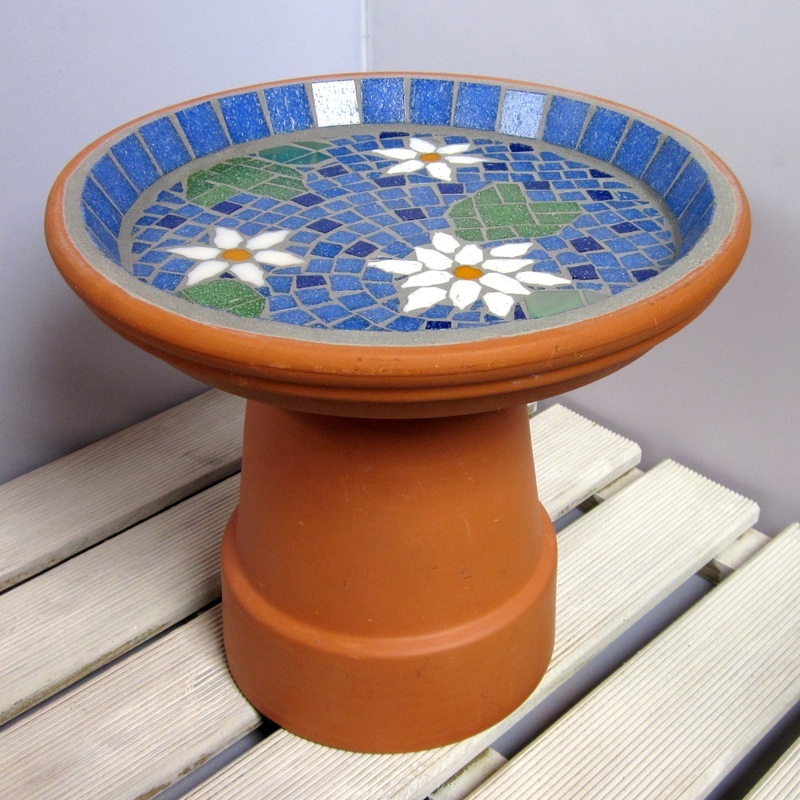 Or, if you would like to raise it up, you could use an upturned terracotta flower pot (around 13-15cm would be ideal - see item pics, not supplied), a plant stand, or pot feet. 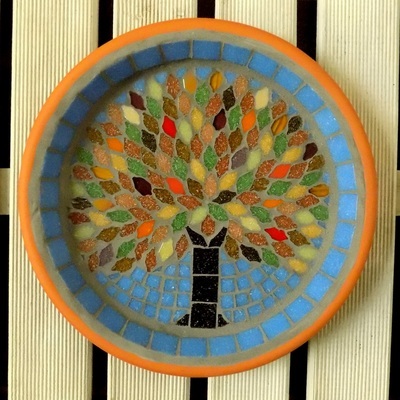 Please Note: This design is made to order. 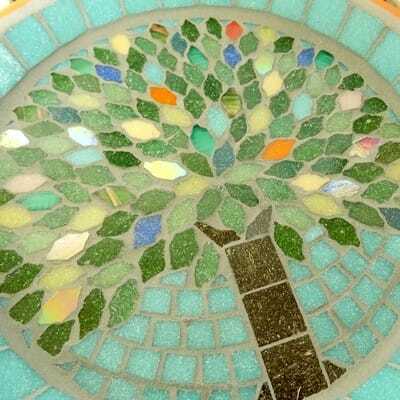 See top of page for details. 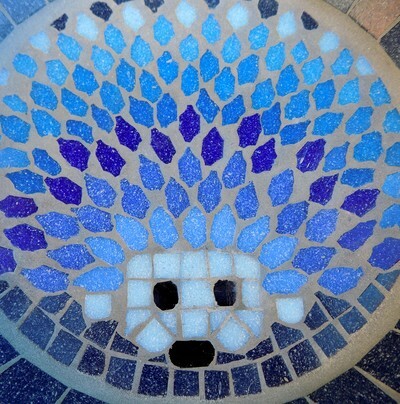 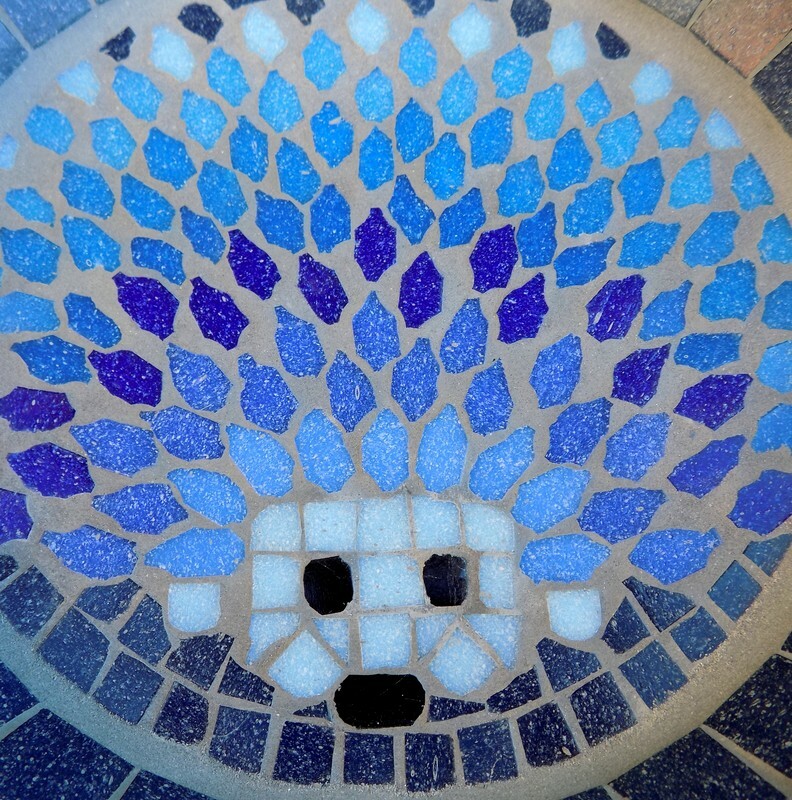 This design has a hedgehog in shades of blue from sky to sapphire, and turquoise to aqua. 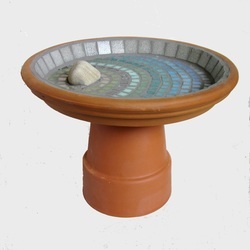 The saucer can be used as a bird bath for large and small garden birds. 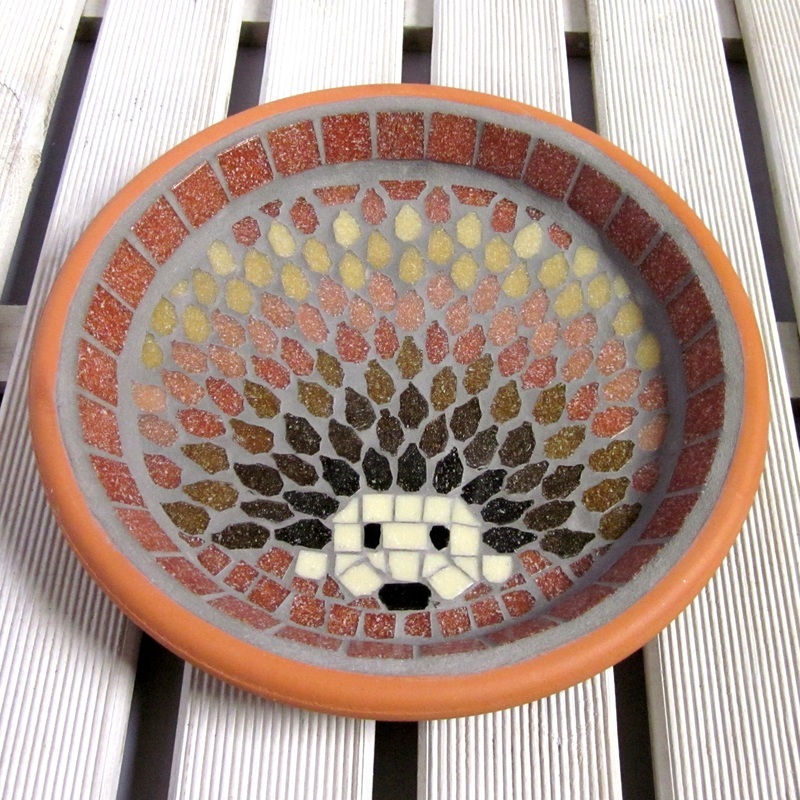 And it can also be used as a water dish for your garden wildlife, including hedgehogs too. 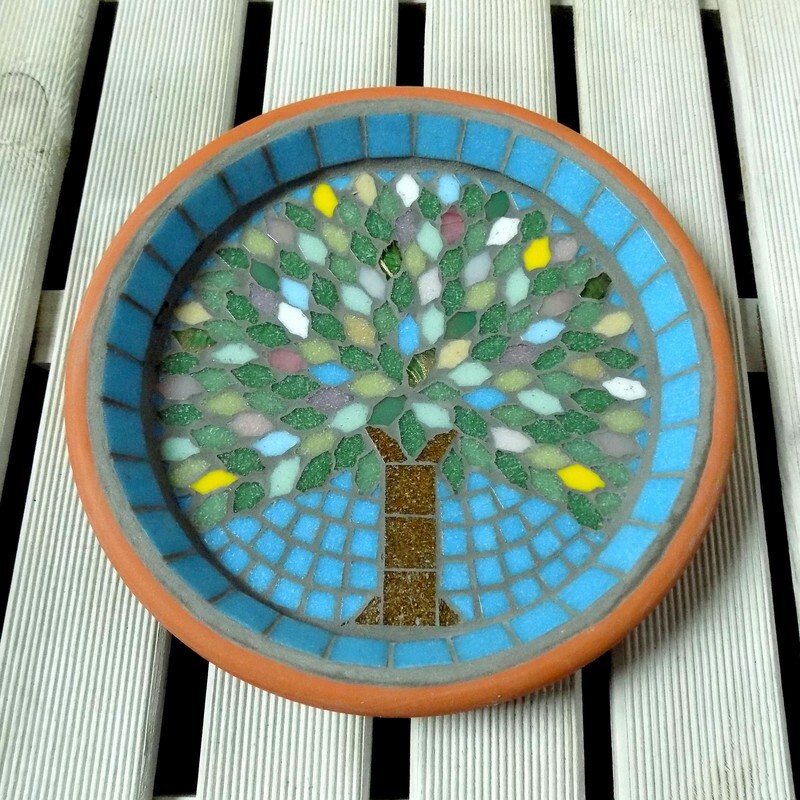 A great gift for a garden or nature lover. This bird bath design has a mosaic hedgehog in shades of reds, creams and browns from sand to dark chocolate and terracotta. The saucer can be used as a bird bath and water dish by large and small garden birds. And if placed on the ground it can also be used as a water dish for your garden wildlife, including hedgehogs too. A great gift for a garden or wildlife lover. 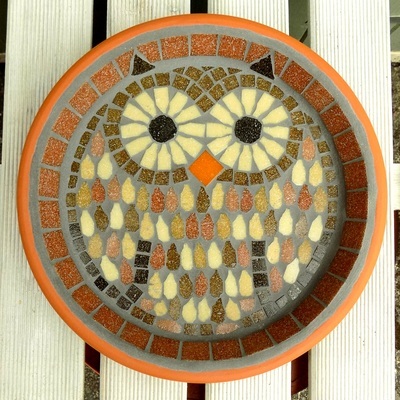 A mosaic owl made with shades of brown, terracotta and cream, makes this birdbath a great garden ornament as well as being practical for your garden birds to bathe in and for other garden wildlife to come and drink from too. 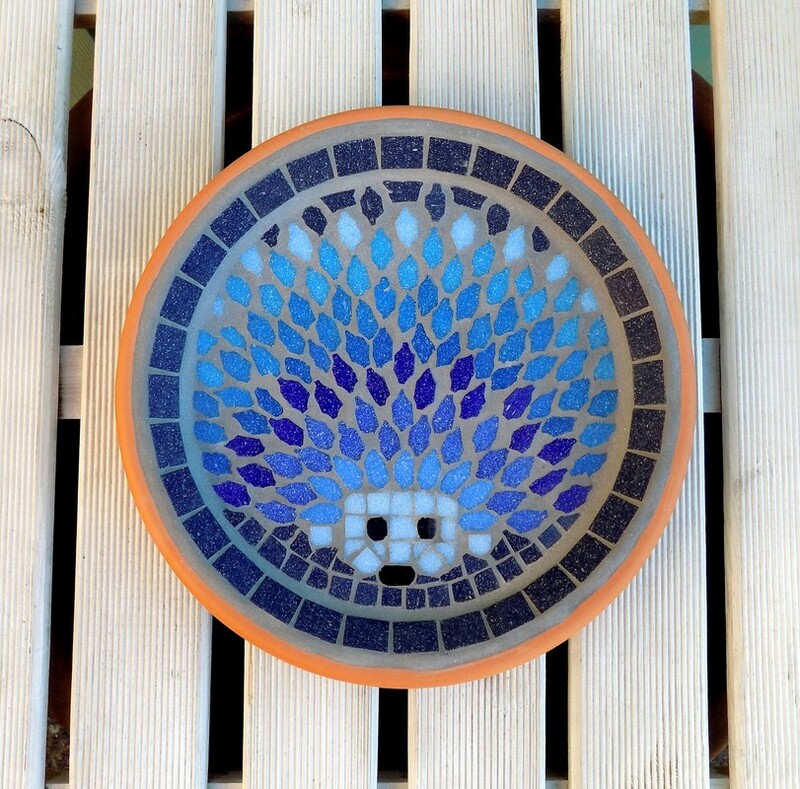 It would also be a perfect gift for a gardener, wildlife lover, or even as a new home gift. 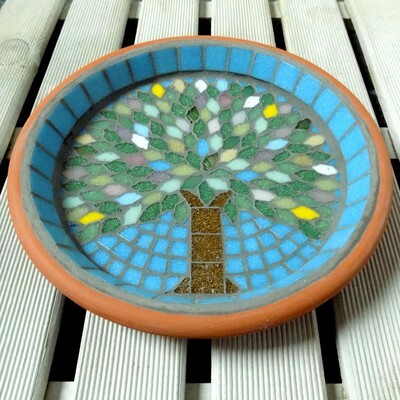 This listing is for the bird bath saucer only. The saucer can be used freestanding on the ground. Or, if you would like to raise it up, you could use an upturned terracotta flower pot (around 13-15cm would be ideal - see pic, not supplied), a plant stand, or pot feet. A lovely bird bath with a calming design which draws the eye around the three bumblebees in aqua blue circles, with a darker summer turquoise sky blue background. 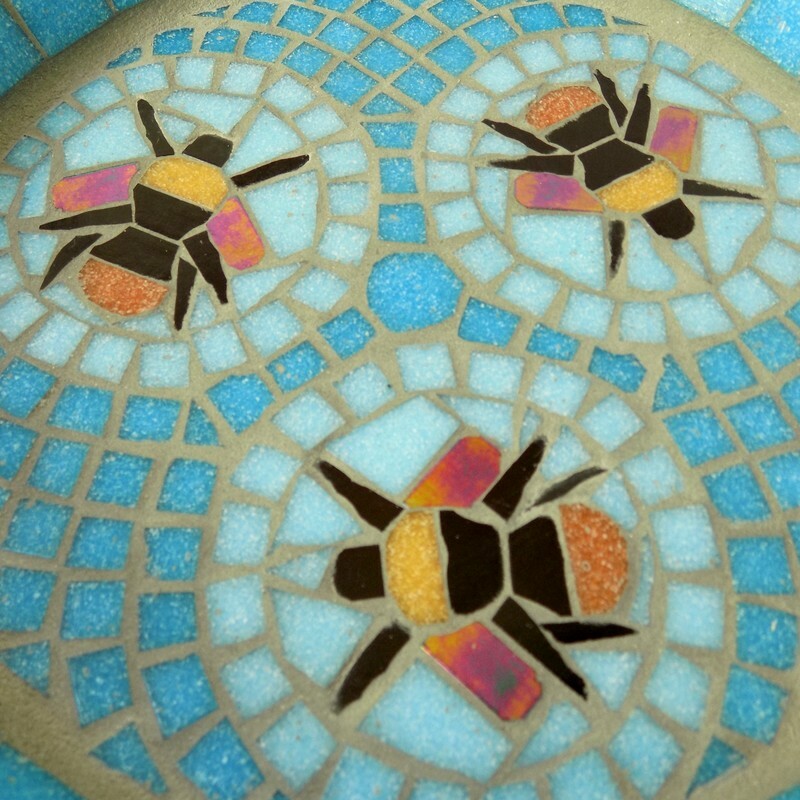 Each bee has iridescent wings that shine with metallic colours when the light catches them (the colours of the metallic shine may differ from the colours in the photo, so could be more blues and golds). 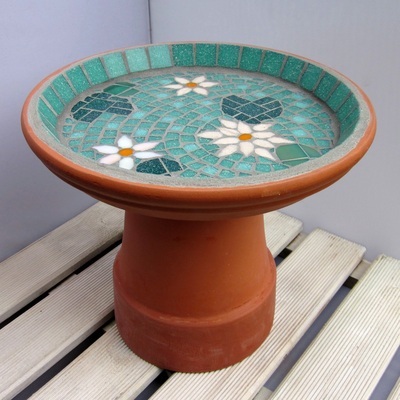 This bird bath is ideal for adding colour in the garden, or as a feature ornament on a patio, or deck. Great for birds to bathe in and other wildlife to drink from, including hedgehogs as the bird bath is weighty enough not to tip if they stand on the edge. 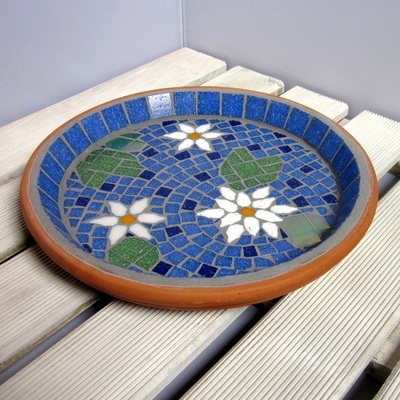 It's also a perfect gift for anyone who likes gardening or is a nature lover. 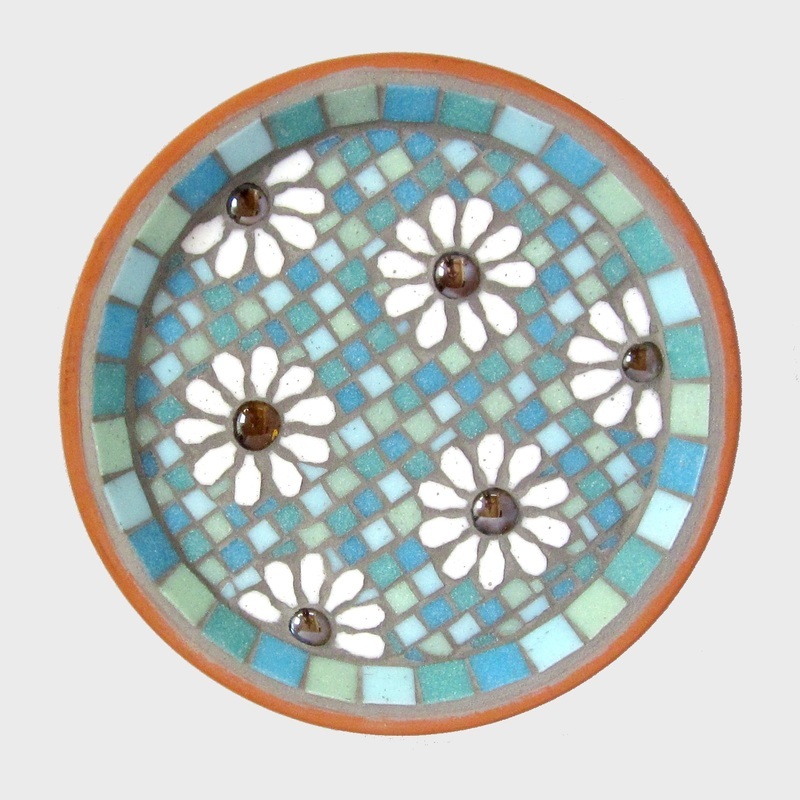 This listing is for the bird bath saucer only. 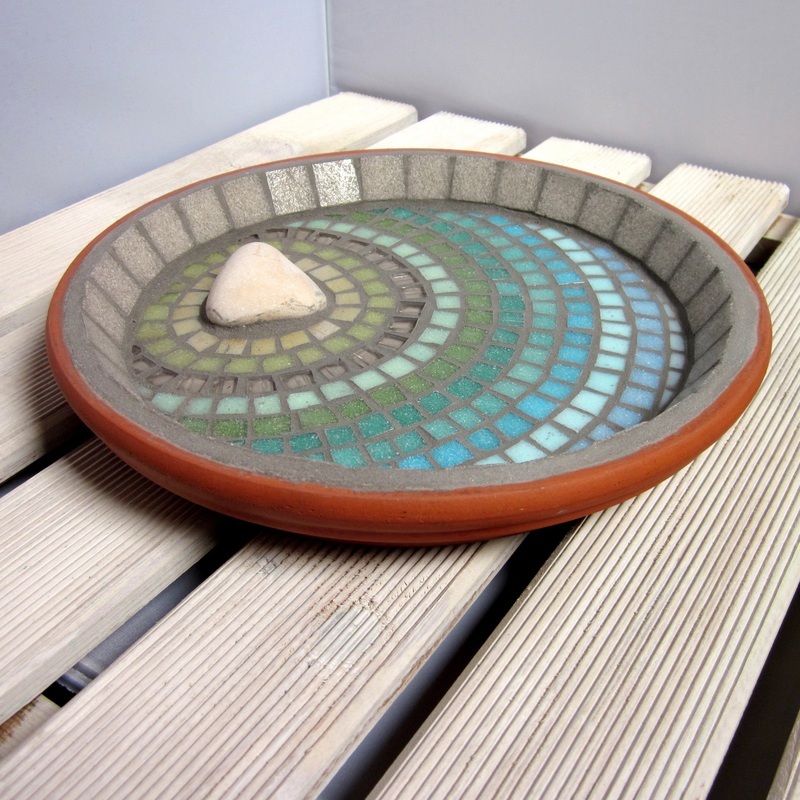 The saucer can be used freestanding on the ground. Or, if you would like to raise it up, you could use an upturned terracotta flower pot (around 13-15cm would be ideal - see pic, not supplied). 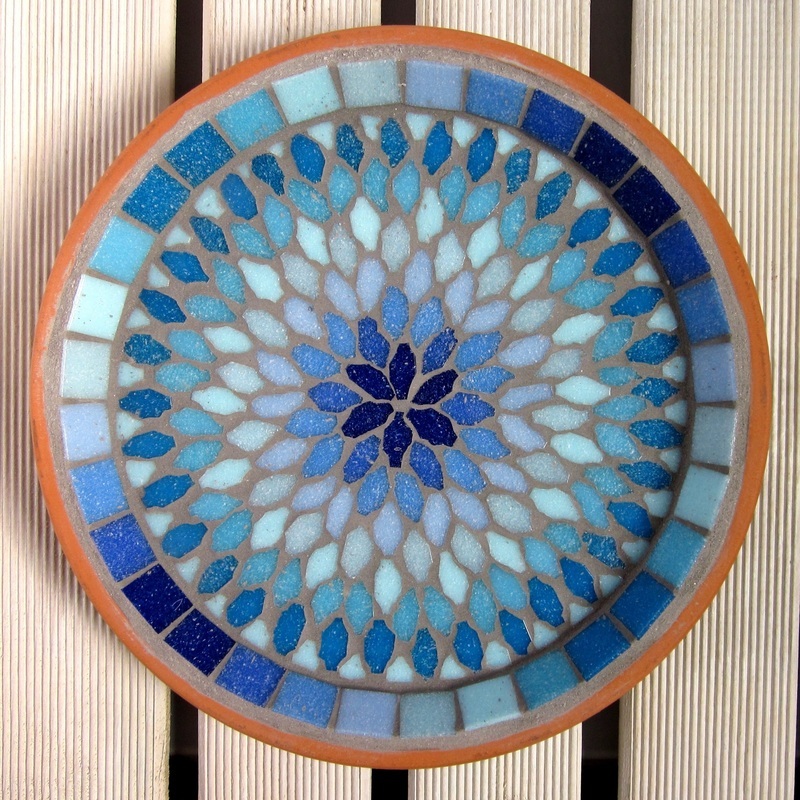 There's a cool feel to the graduated design on this mosaic bird bath using all shades of blue from turquoise and pastel aqua to deep sapphire and pale sky. 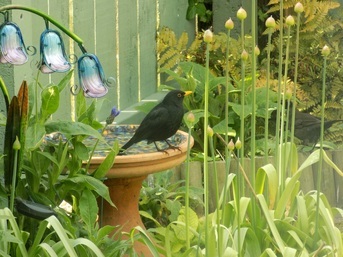 A lovely addition to any garden adding colour, interest, and somewhere for wildlife to drink and the birds to bathe. It would make a lovely gift for a gardener, nature, or wildlife lover. 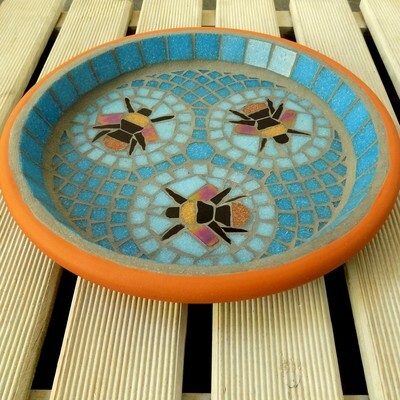 This listing is for the bird bath saucer only. The saucer can be used freestanding on the ground, raised slightly with pot feet, or you could raise it up on an upturned terracotta flower pot (around 13-15cm would be ideal - see pic, not supplied). 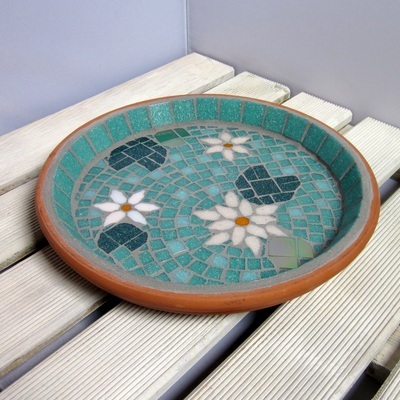 This mosaic garden pond design bird bath has three water lily flowers, there are two white flowers, one large and one small, and also a small iridescent pale pink lily too. 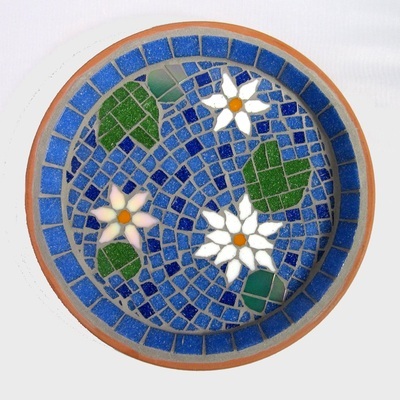 The lily pads are made with matt green and iridescent green tiles. 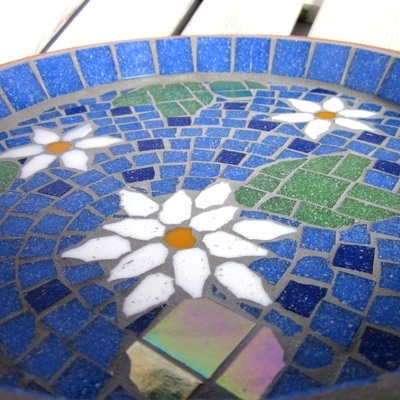 The iridescent tiles shine with metallic colours when the light catches them. The pond background is made with deep sky blue tiles and cobalt blue dotted around adding interest to the design. 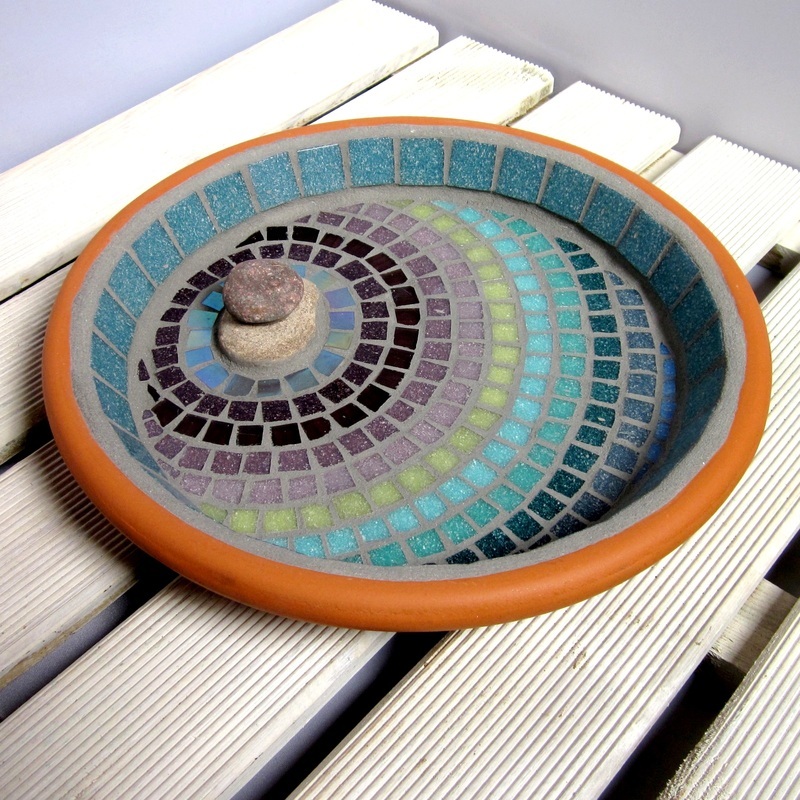 This birdbath means anyone can have a decorative pond in even the smallest space, and it's great for adding a bit of colour in the garden. Or use it as a feature on a patio, or deck. 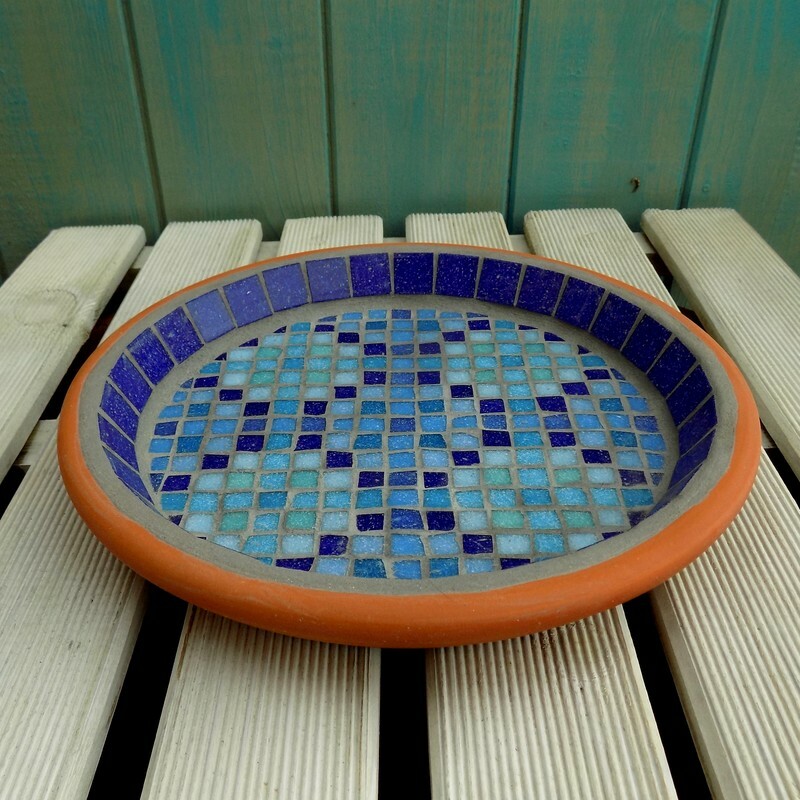 It's ideal for birds to bathe in and other wildlife to drink from. 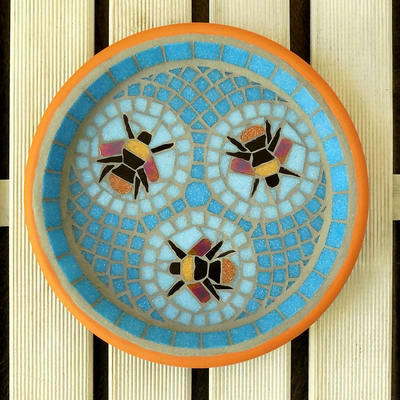 It would also make a perfect gift for a gardener, or wildlife lover. 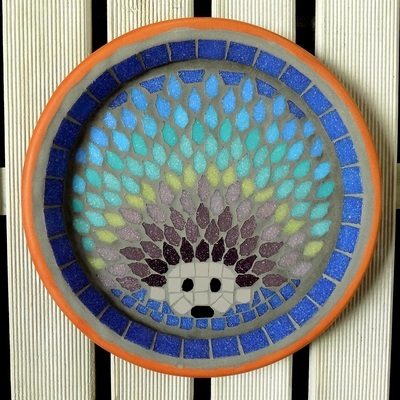 This listing is for the saucer only. 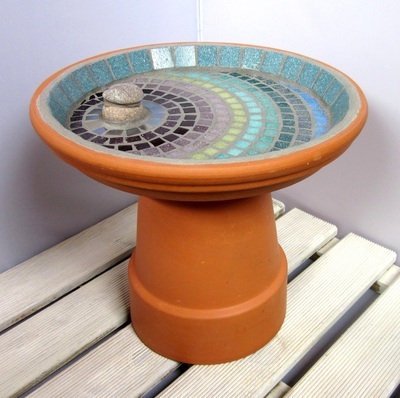 The saucer can be used freestanding on the ground, raised on pot feet, or you could raise it up using an upturned terracotta pot (not supplied). 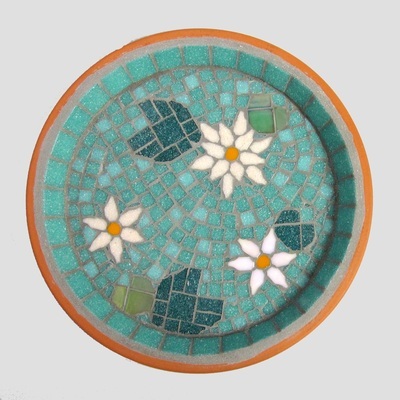 This mosaic pond design bird bath has three water lily flowers, two are matt pastel pink, and one is iridescent pale peach/pink. The lily pads are made with matt and iridescent jade green tiles. 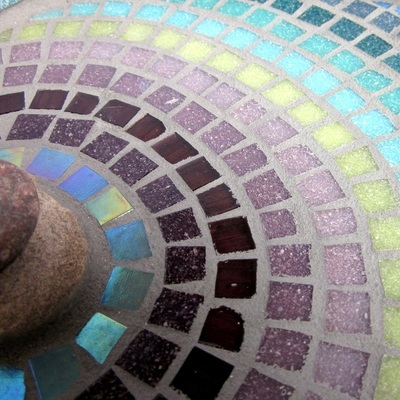 All the iridescent tiles shine with metallic colours when the light catches them. 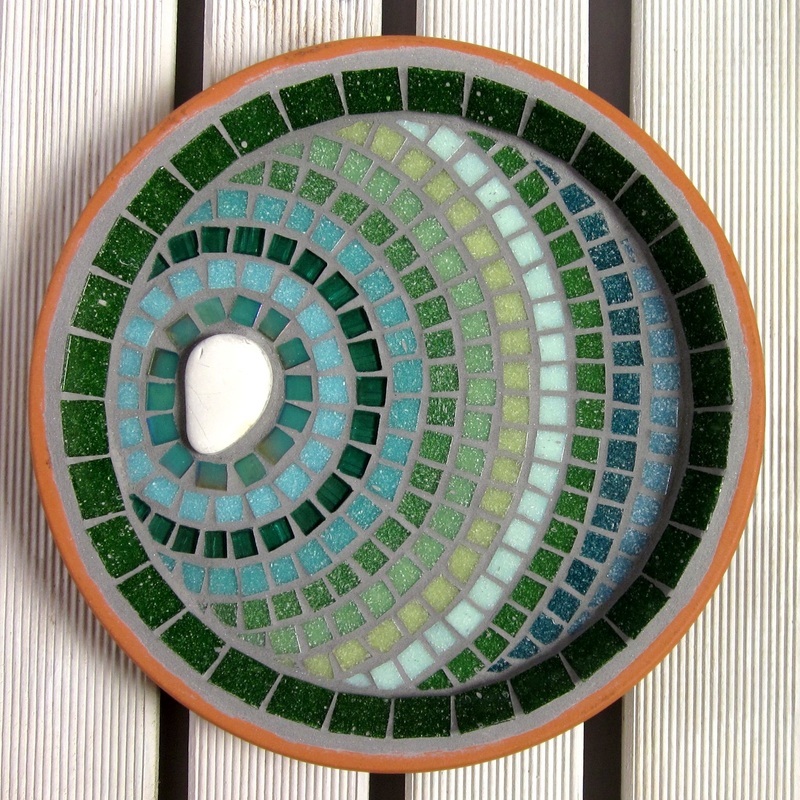 The pond's background is made with two shades of jade green tiles. 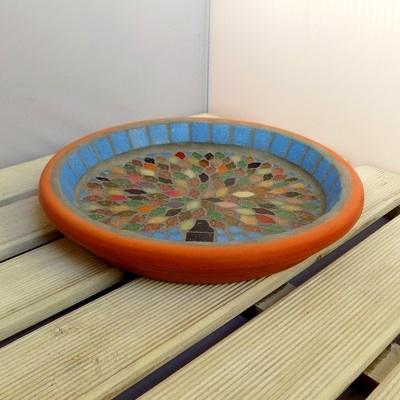 This birdbath is great for adding a bit of colour in the garden, and great for birds to bathe in and other wildlife to drink from, including hedgehogs as the bird bath is weighty enough not to tip if they stand on the edge. It would also make a perfect gift for a gardener, wildlife lover, or grow your own fans as it attracts nature's natural pest controller. 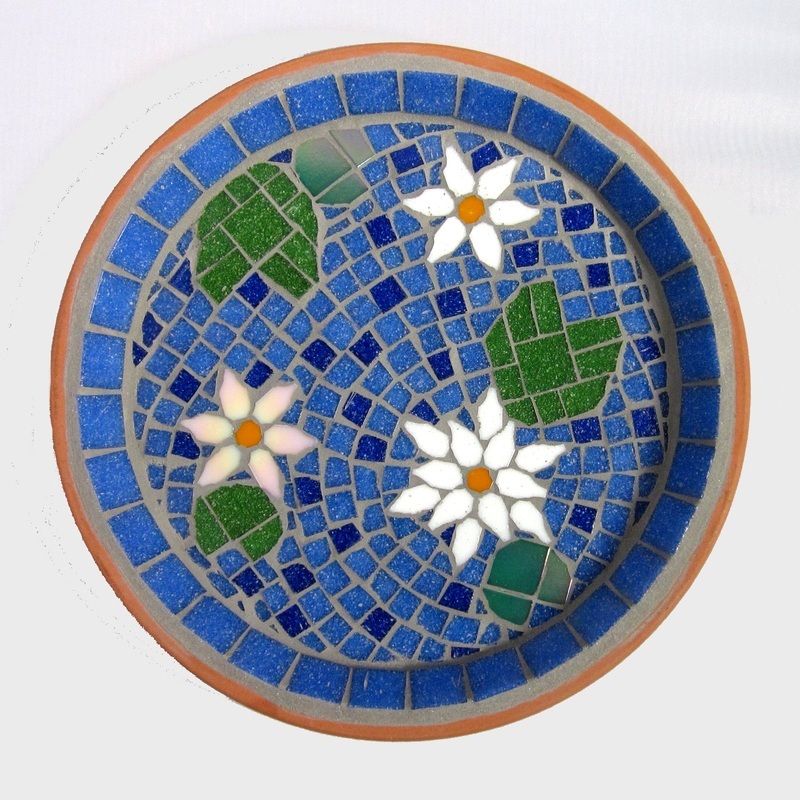 Please Note: This design is ﻿made to order﻿. 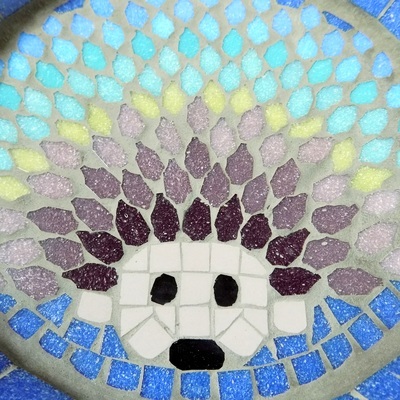 See top of page for details. 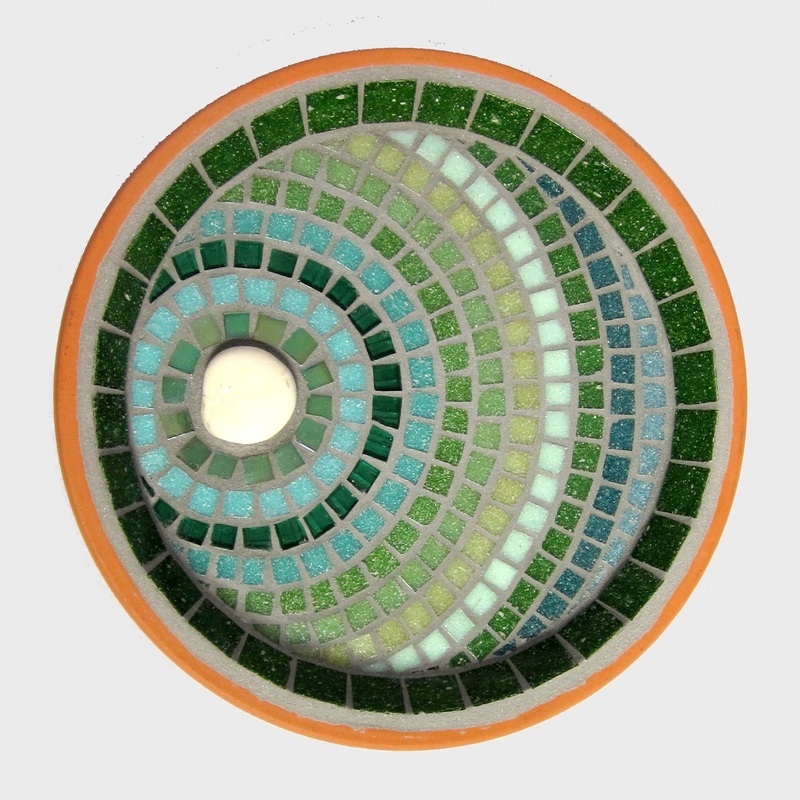 The mosaic ripples in this garden bird bath are in all shades of green including teal, apple, jade, sea, pea, mint, and emerald. There are also ripples of iridescent and translucent jade tiles to add interest and depth to the design. 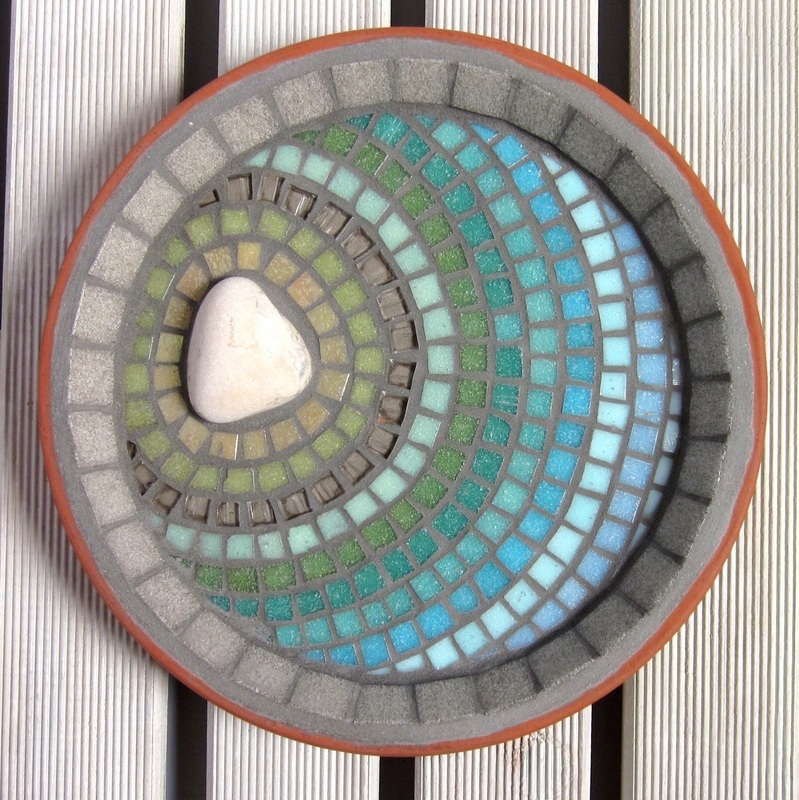 It's finished with a white ceramic stone. 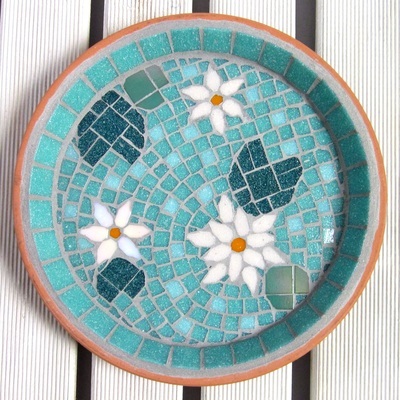 A really calming colour combination, that would suit any style of garden. This listing is for the saucer only. The saucer can be used freestanding on the ground, raised on pot feet, or you could raise it up using an upturned terracotta pot (not supplied). Great for birds to bathe in and other wildlife to drink from, including hedgehogs as the bird bath is weighty enough not to tip if they stand on the edge. 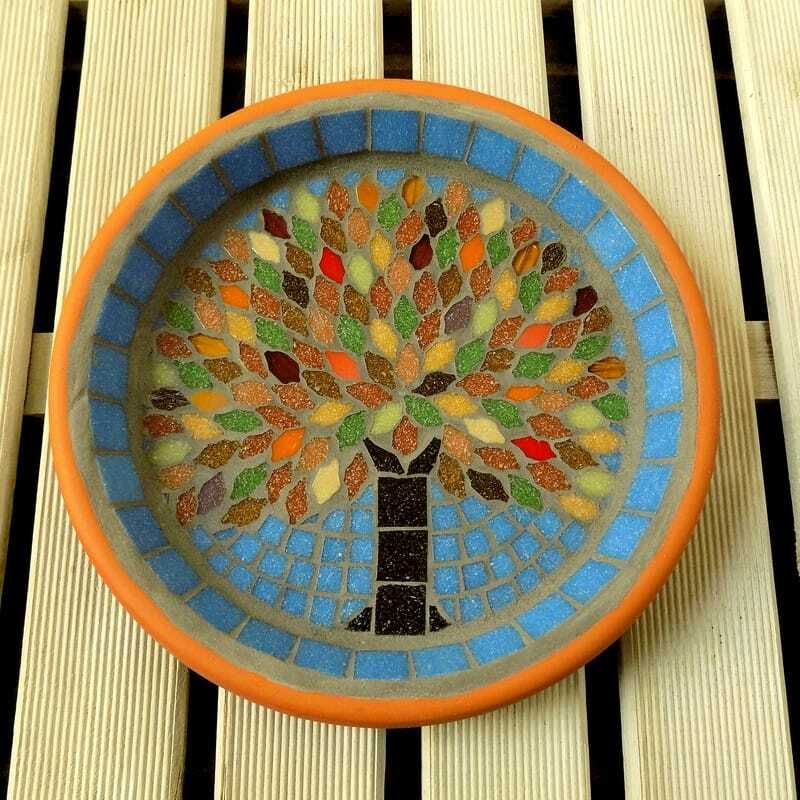 Please Note: This design is made to order. 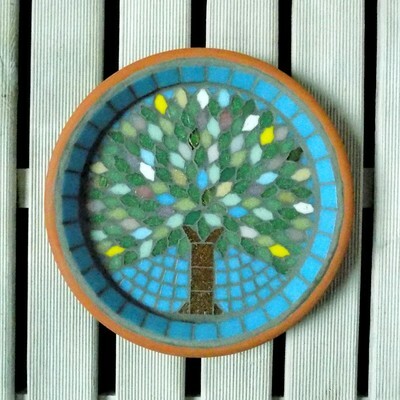 See top of page for details. 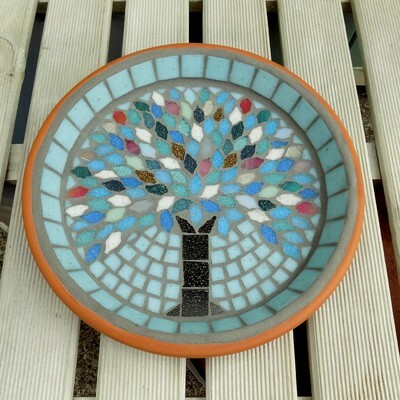 The stone used may differ in size and shape from the one pictured but will still be in keeping with the design. 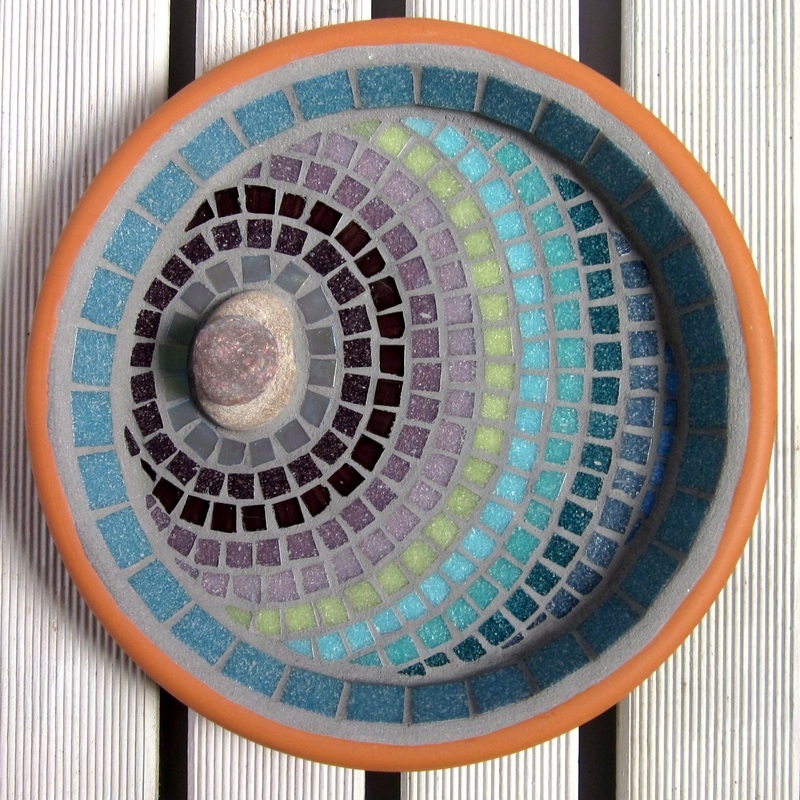 Materials - Terracotta saucer, ceramic pebble, and vitreous glass tiles. 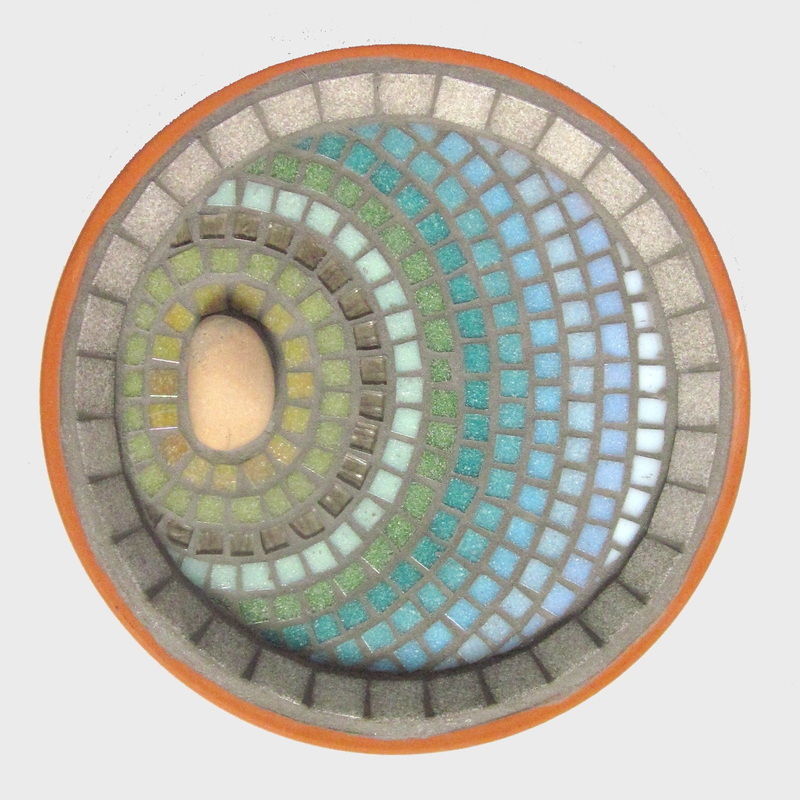 Finished in a grey grout designed to repel algae and mold. This garden mosaic bird bath design has light and pastel shades to give the impression of the sun bleaching and fading the tile colours. 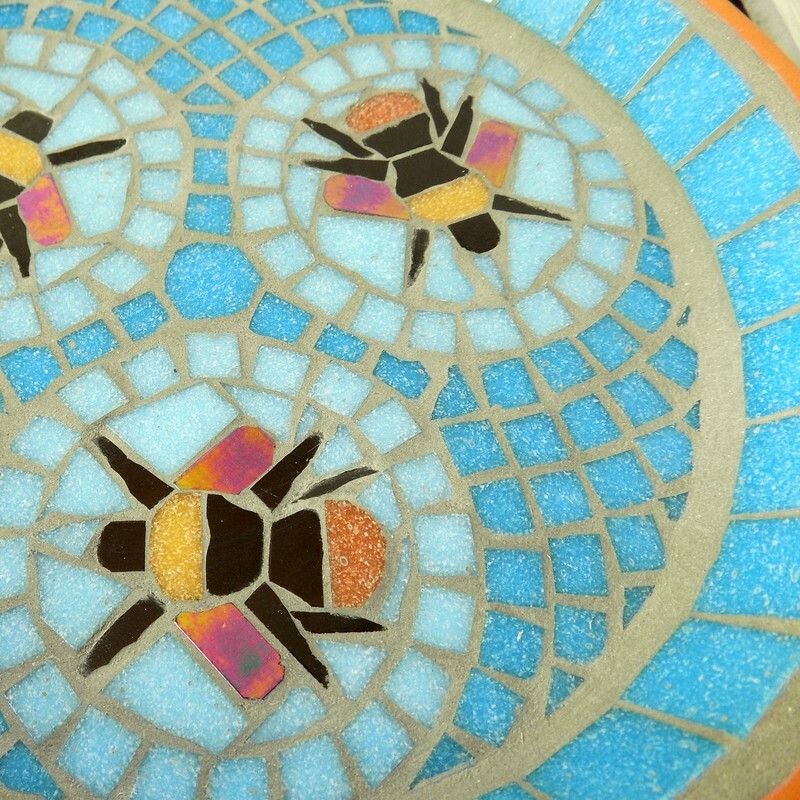 The colours used are the colours of the seaside on a summer's day. 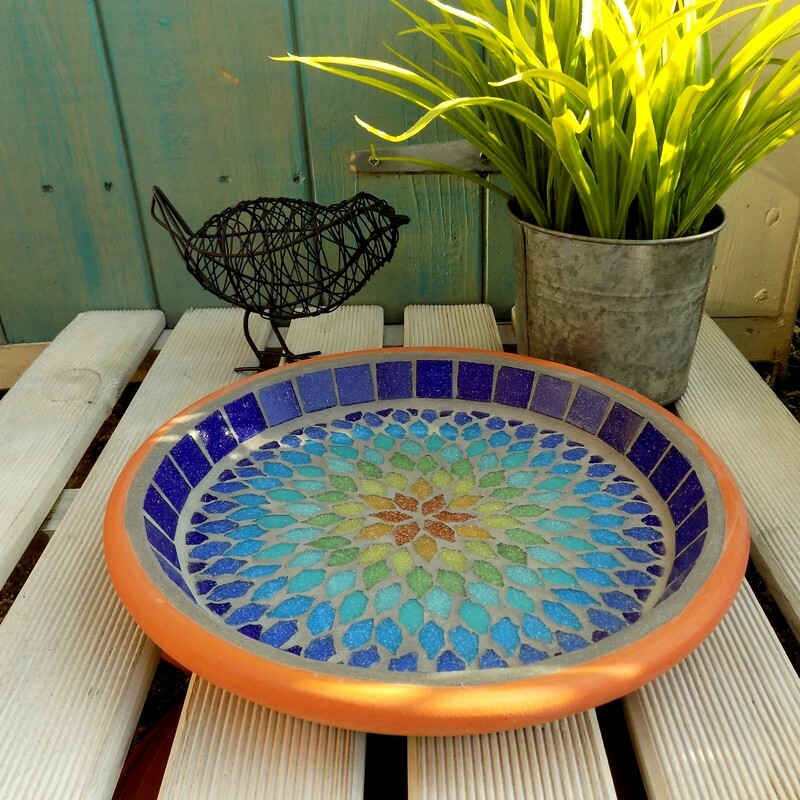 Bring a bit of that summer feeling in your garden. 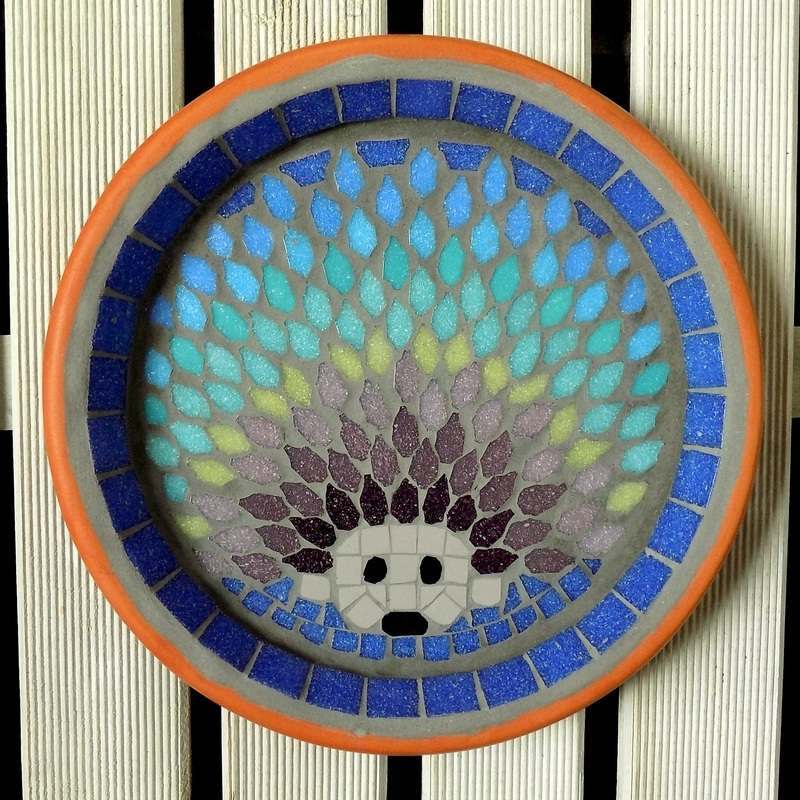 This listing is for the saucer only. The saucer can be used freestanding on the ground, or you could raise it up using an upturned terracotta pot (not supplied). 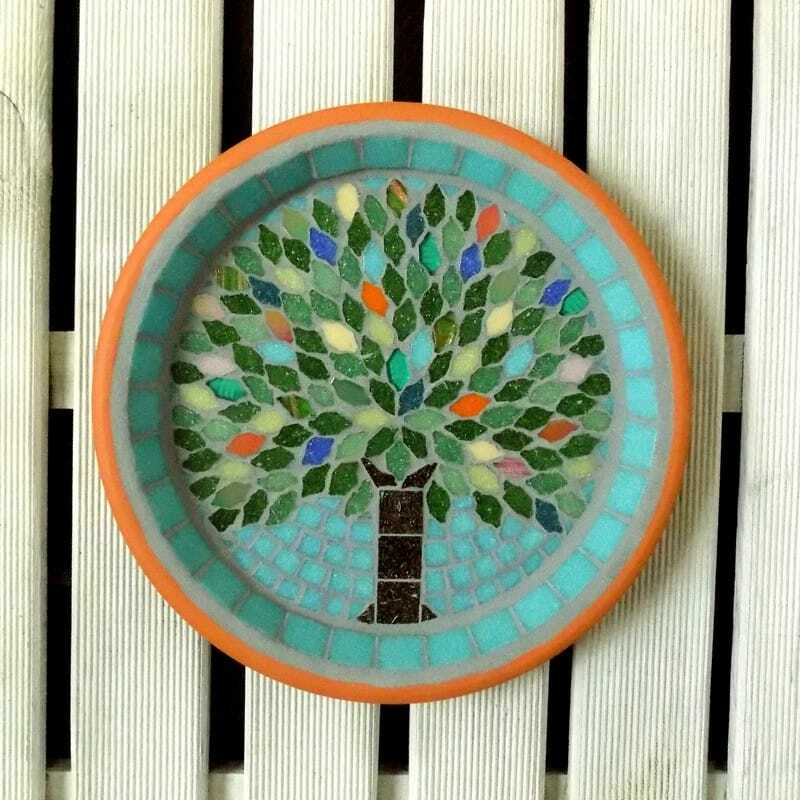 Please Note: This design is made to order. 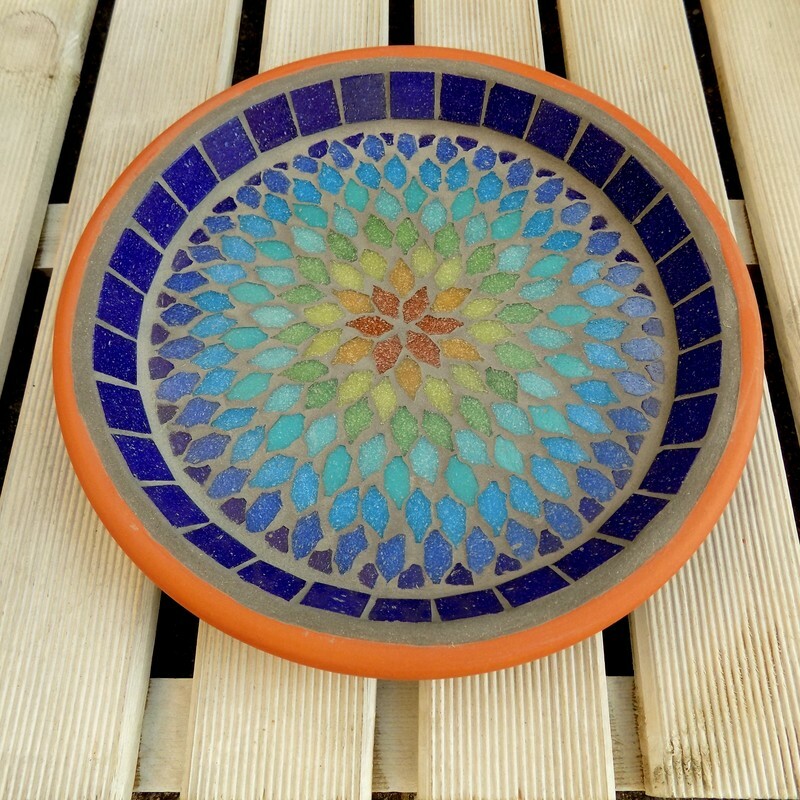 See top of page for details. 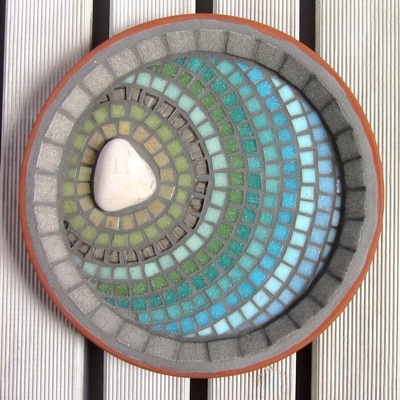 The stone used may differ in size, shape and colour from the one pictured but will still be in keeping with the design. Materials - Terracotta saucer, stone pebble, and vitreous glass tiles. 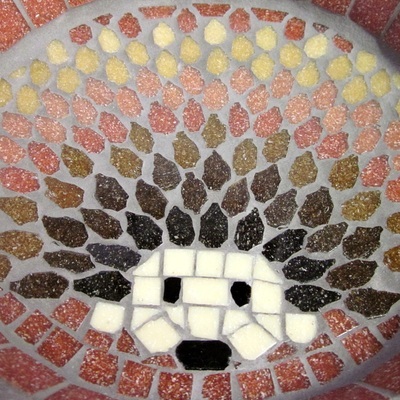 Finished in a grey grout designed to repel algae and mold. 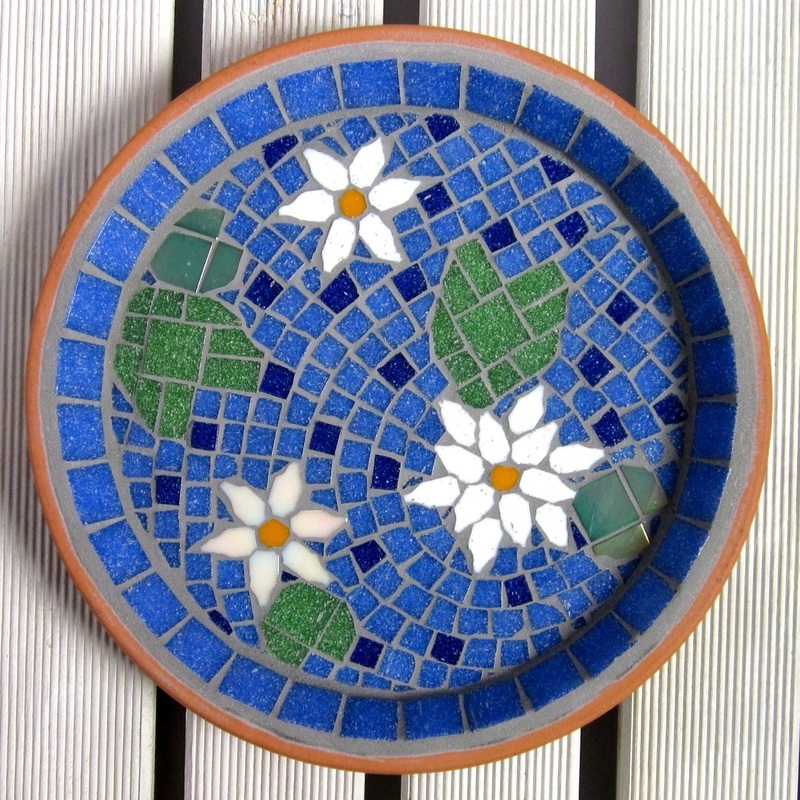 Non-UK Customers see Ordering Info at the top of this page for where to order in your own currency and with your country's postage. 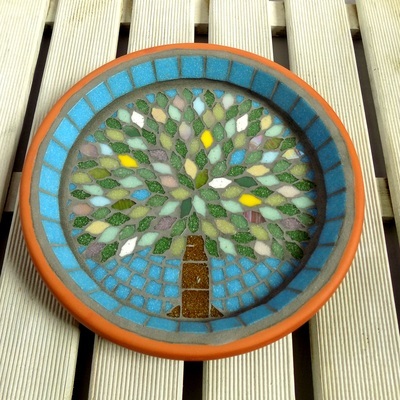 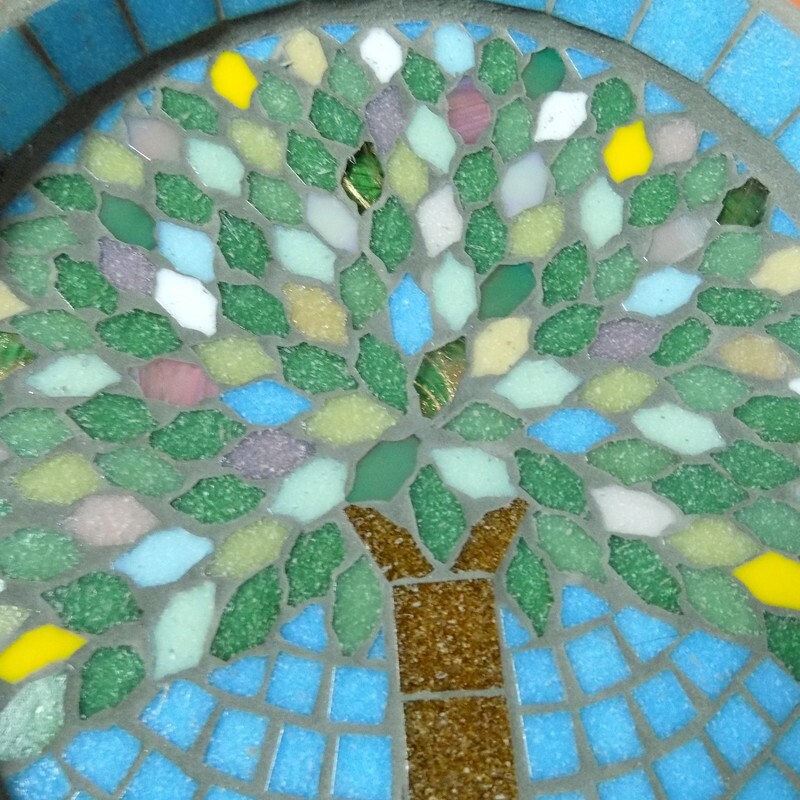 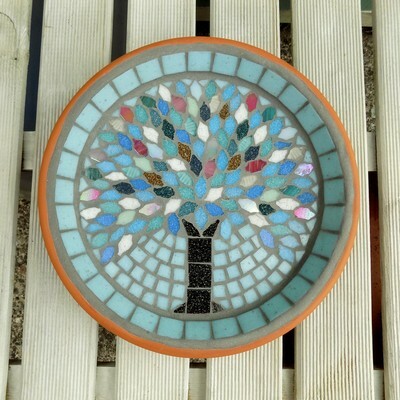 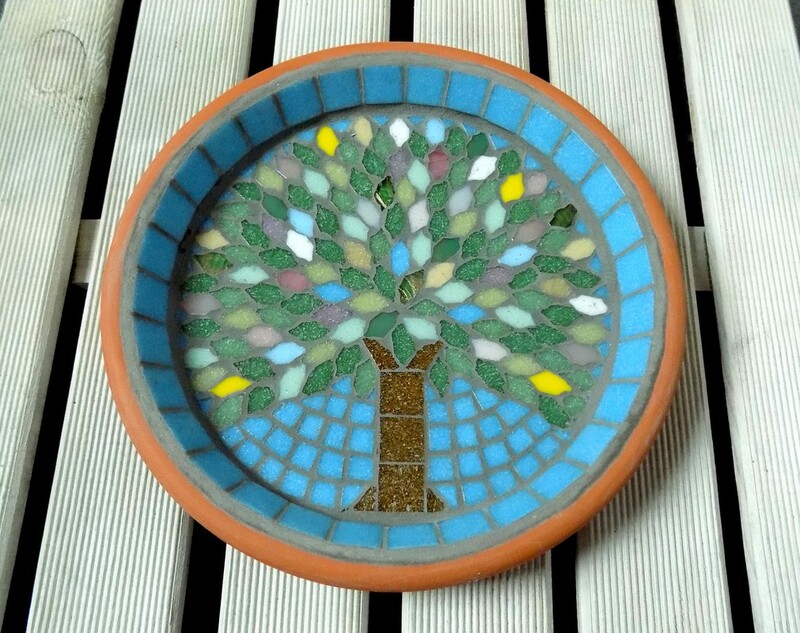 The colours used in this garden mosaic birdbath are inspired by heather moorland with purples, greens, and blue/greys. There is a ripple of iridescent tiles around the Scottish pebble stone stack which shine with metallic blues and magenta. 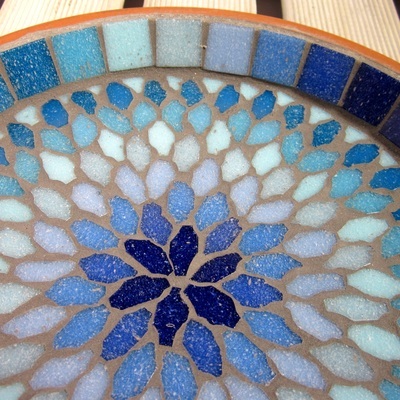 A ripple of translucent deep plum glass gives depth to the design. 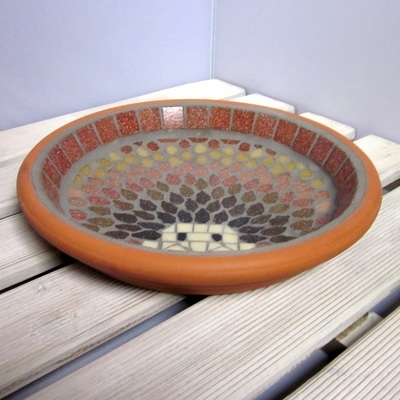 Great for the birds and great as a decoration for the garden too. Please Note: This design is made to order. See top of page for details. The stones used will differ in size, shape and colour from the ones pictured but will still be in keeping with the design. 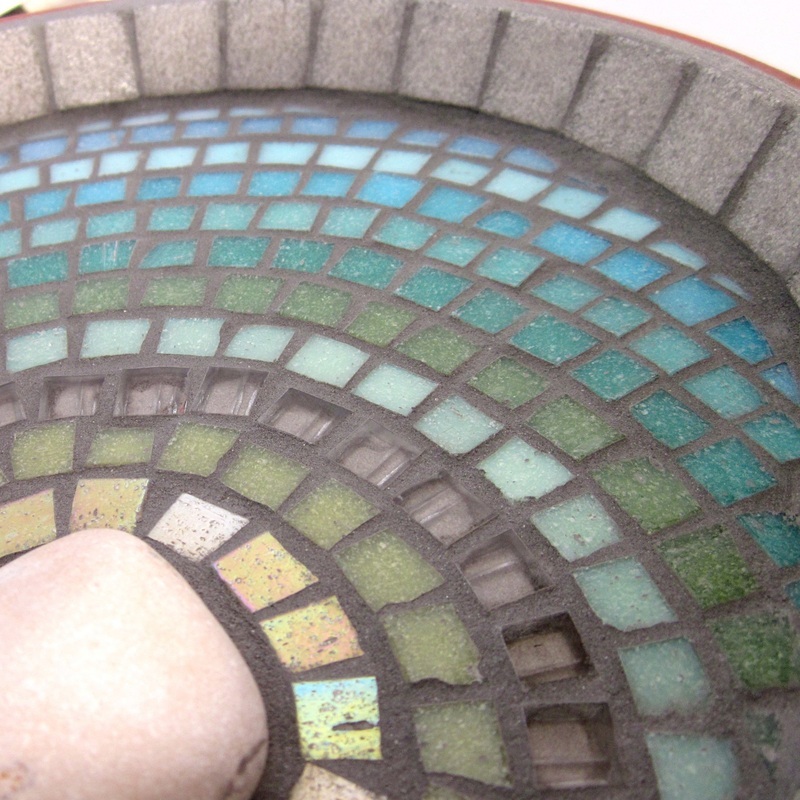 Materials - Terracotta saucer, stone pebbles, and vitreous glass tiles. Finished in a grey grout designed to repel algae and mold. 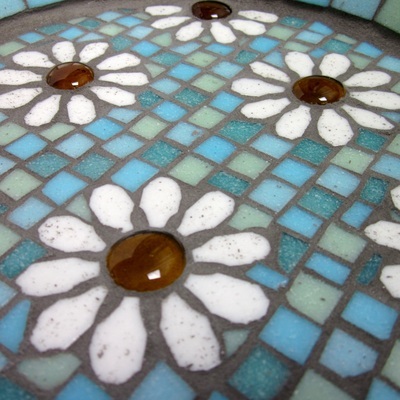 The white daisy flowers on this mosaic bird bath have translucent amber glass centres, giving depth to the design. 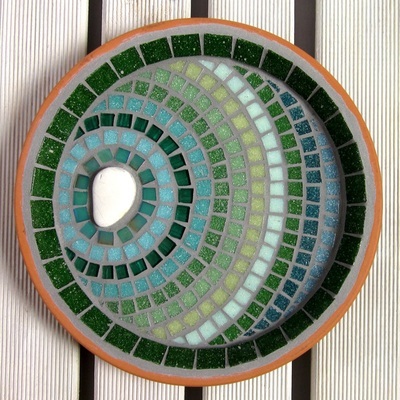 The background tiles are light and pastel shades of blue, green, and aqua, giving a lovely soft effect. 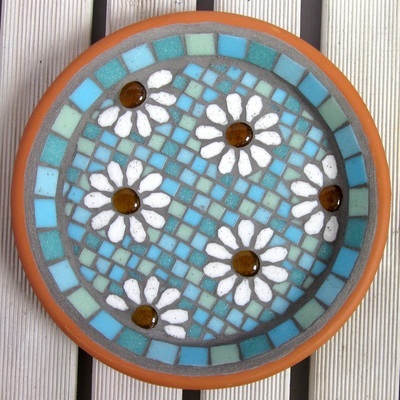 It would look great in any garden, and the birds will love bathing in their daisy filled garden bath. 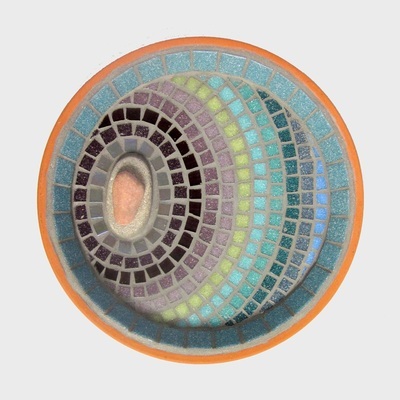 This listing is for the saucer only. 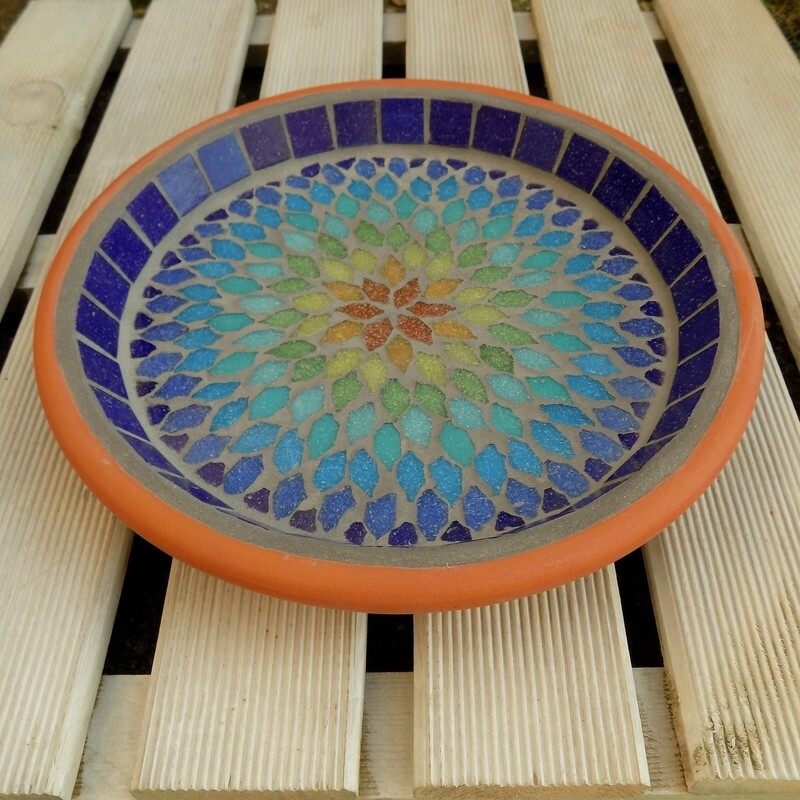 This saucer can be used freestanding in the ground, raised on ppot feet, or you could raise it up using an upturned terracotta pot (not supplied). Great for birds to bathe in and other wildlife to drink from, including hedgehogs as the bird bath is weighty enough not to tip if they stand on the edge. Please Note: This design is a made to order. See top of page for details. 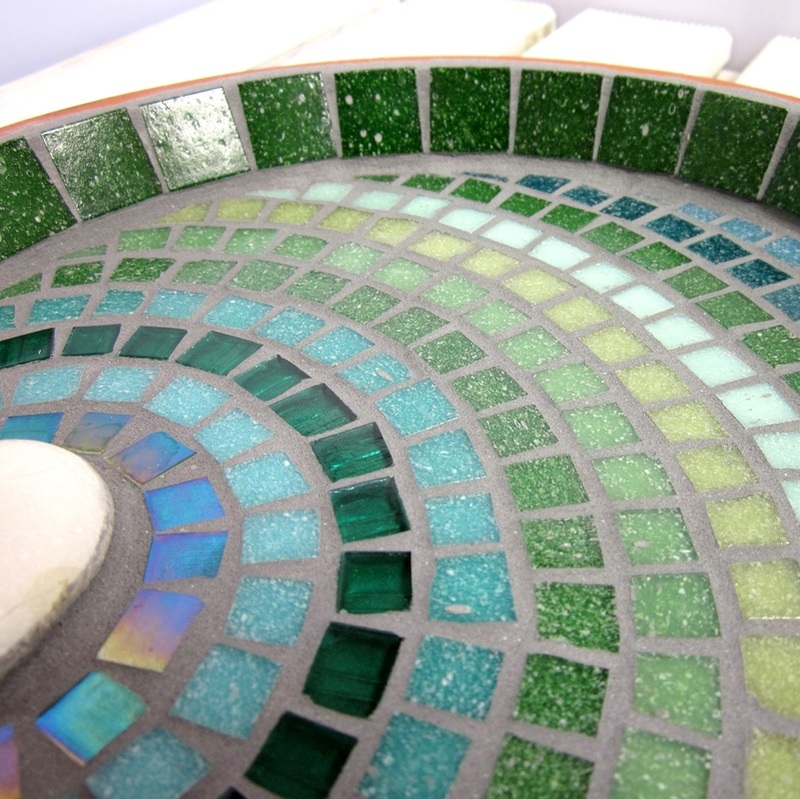 Materials - Terracotta saucer, glass gems and vitreous glass tiles. 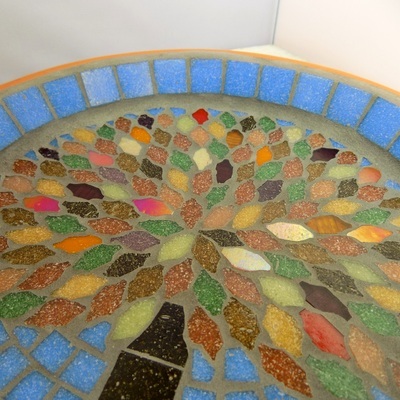 Finished in a grey grout designed to repel algae and mold.